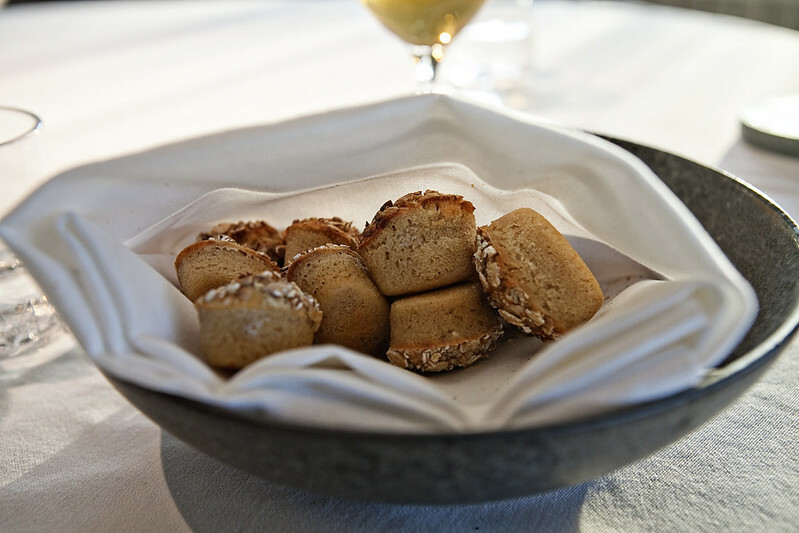 After a very appetizing array of beautifully and creatively prepared amuse bouche, we were served with bread and not-your-ordinary butter and absolutely delicious appetizers. 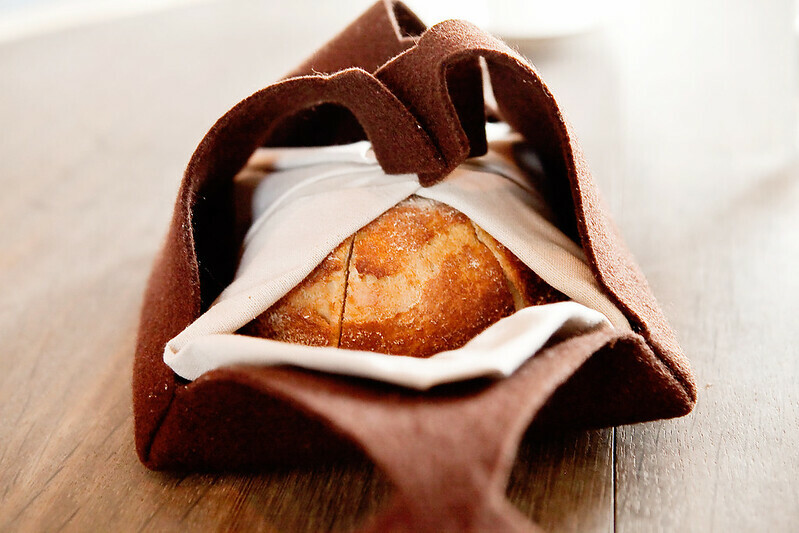 Bread and butter – The bread was wrapped in a felt-like cloth, which I envisioned to be something that vikings would wrap their food with. The bread was warm and soft covered by a thin crusty layer. There were two types of butter served with the bread. One of which, featured pure pork fat butter topped with crispy bits of pork. 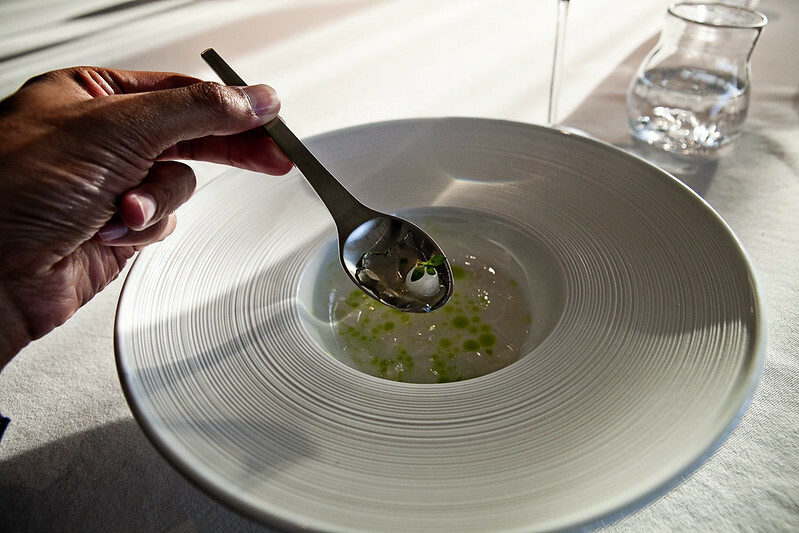 Sea urchin and dill, cucumber and cream – This chilled dish features chunks of sea urchin that scrumptiously melt in your mouth when swallowed. 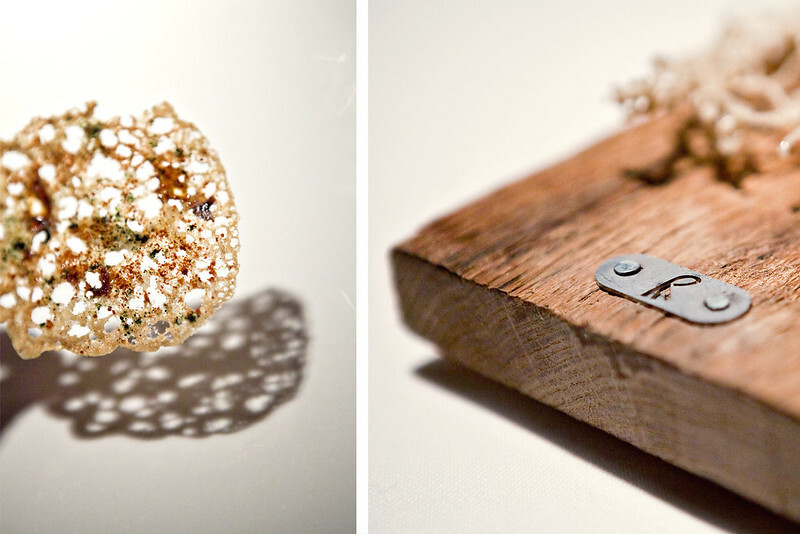 Mixed with the chunks of sea urchin were cucumber pieces made into a ball and coated in cucumber ash. Shavings of frozen cream and dill were also added to the dish. 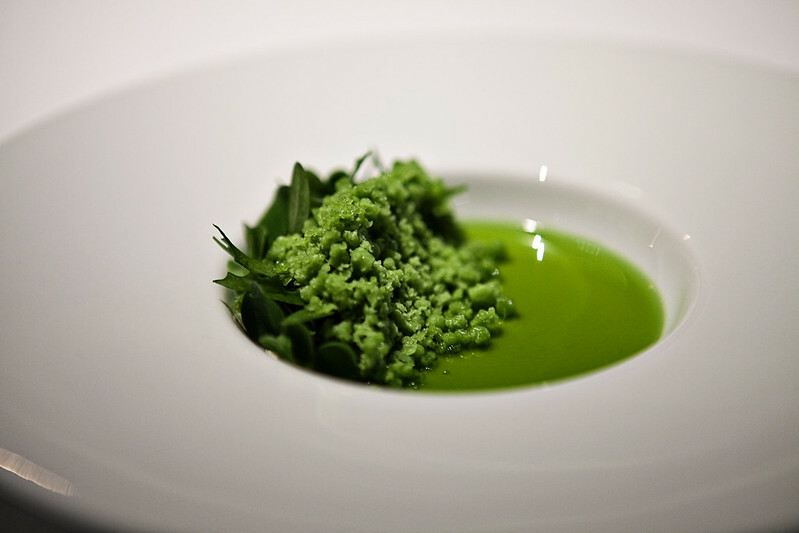 The grass-like freshness from the dill was a refreshing change from the sweet and briny taste from the sea urchin. 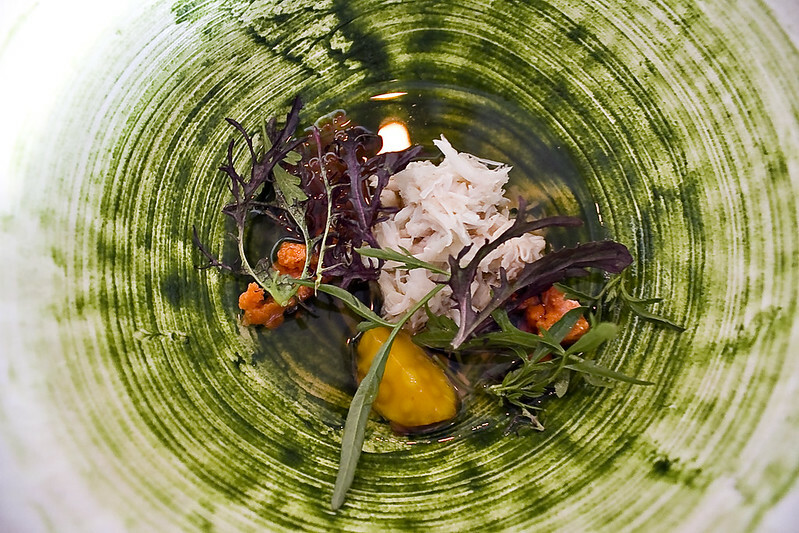 Brown crab, egg yolk and herbs – Danish brown crab meat was the highlight of this beautifully decorated bowl. The meat was delicately sweet and really went well with the salmon and crab roe. All of these fine treasures from the sea together with pre-boiled egg yolks boiled again in verbena tea were brought collectively by Norwegian seaweed broth. This was without a doubt one of my favorite dishes of the night. It was like heaven on earth; simply amazing! 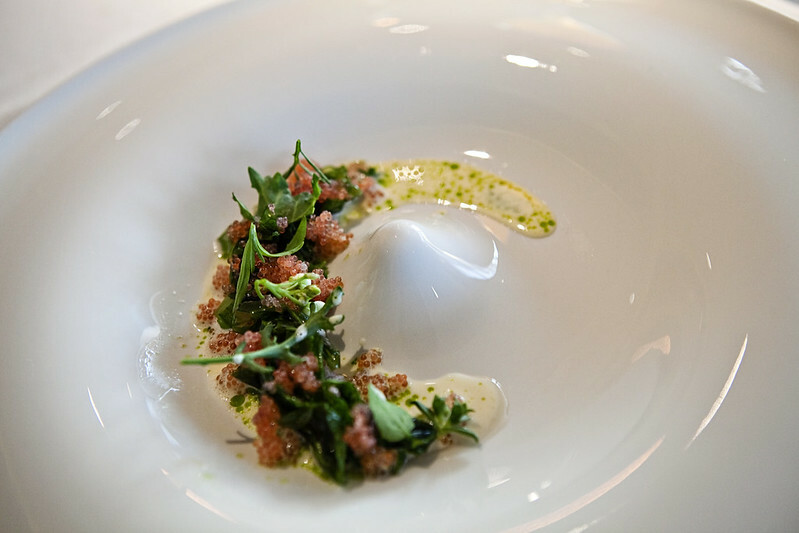 Dried scallops and beech nuts with biodynamic grains and watercress – You’re probably wondering where the scallops were in this dish. They were those brown thin crisps beautifully set on the plate. We were told that the scallops were thinly sliced and each piece dehydrated to crisp. The scallops were flavorful as if they were served directly from the sea. 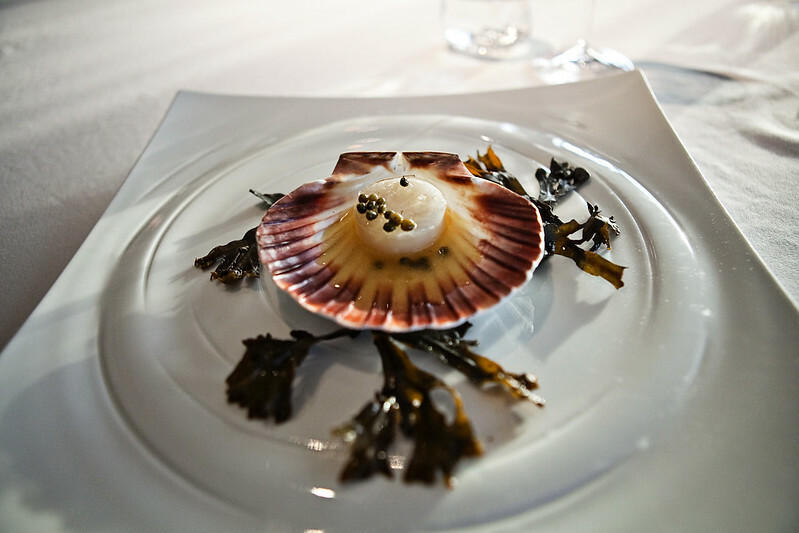 The mussel sauce tinted in squid ink perfected the saltiness of the scallops, while the beech nuts, with its herb-like taste, served as a palette cleanser preparing our taste buds for the next delectable serving. 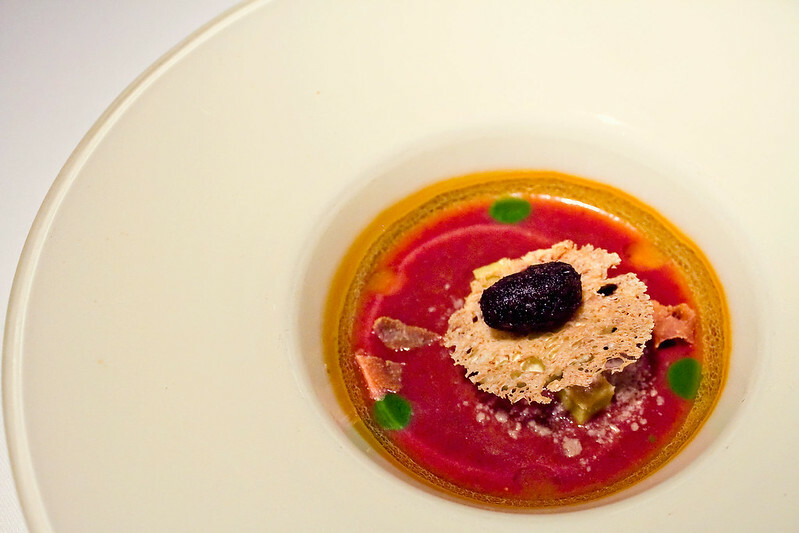 Beets and plums – The plate consisted of roasted beetroot immersed in broth made of fermented fennel and plum. Each bite oozed with strong concentrated flavors - sweet, earthy and clean. 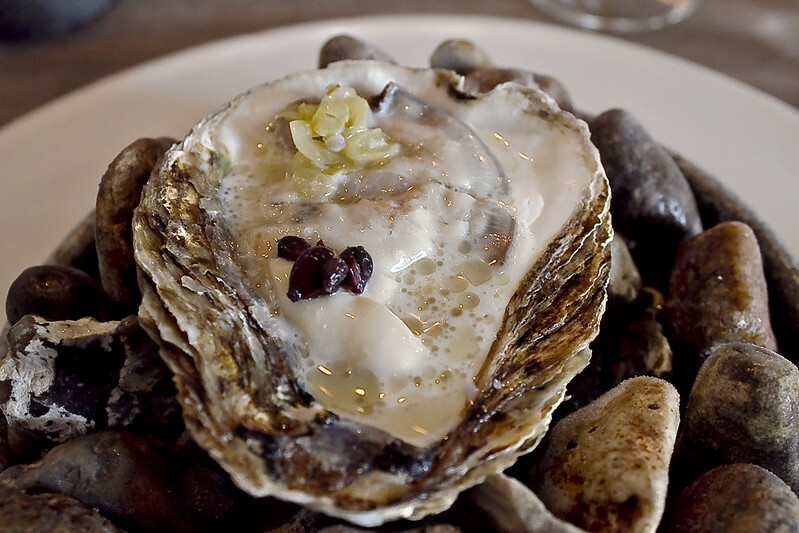 Oyster from Limfjorden, gooseberry and buttermilk – Oysters from Limfjorden are considered to be one of the best in the world. 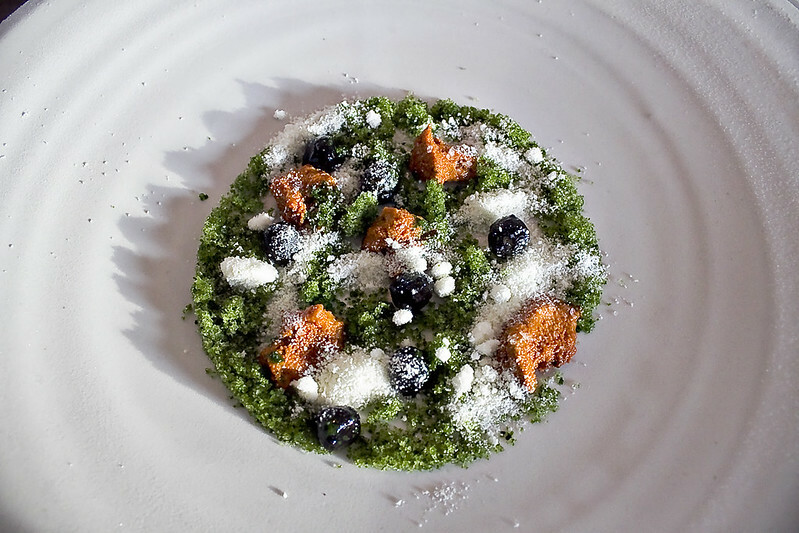 Combined with the magic that Noma’s skilled chef’s were able to concoct, it’s no surprise that this dish was yet another mind-blowing one. Each buttery chunk glided down our mouths effortlessly. And similar to all of Noma’s other ingredients, the Oysters were fresh. They were so fresh that I could taste the sea! 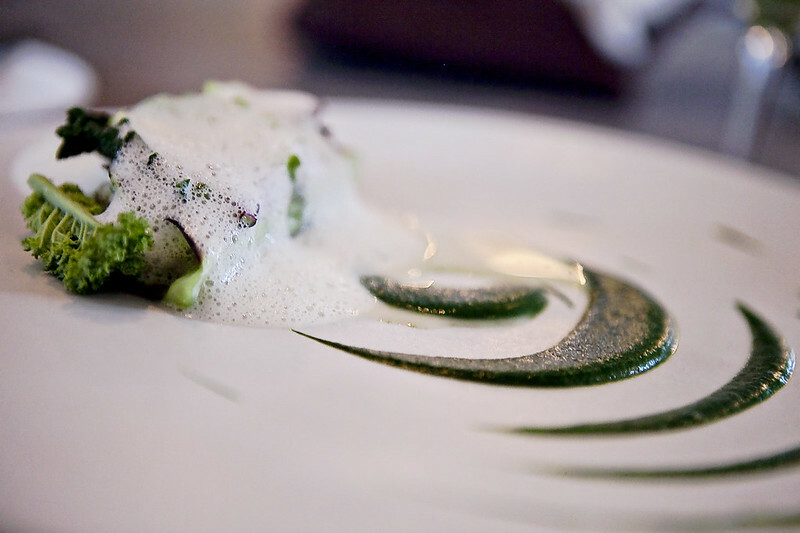 Pike perch and cabbages with verbena and dill – This dish has a smoky flavor to it. 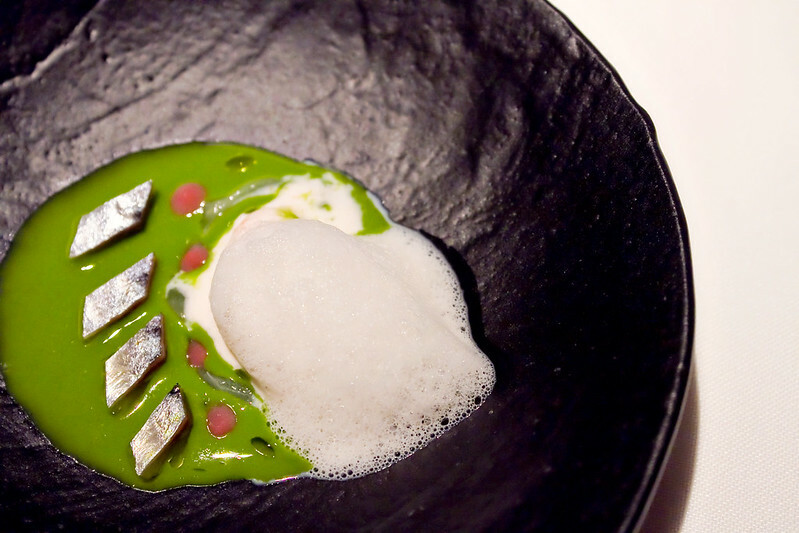 After all, this dish showcases grilled cabbages stuffed with pike perch sitting on a sauce made from verbena and dill. 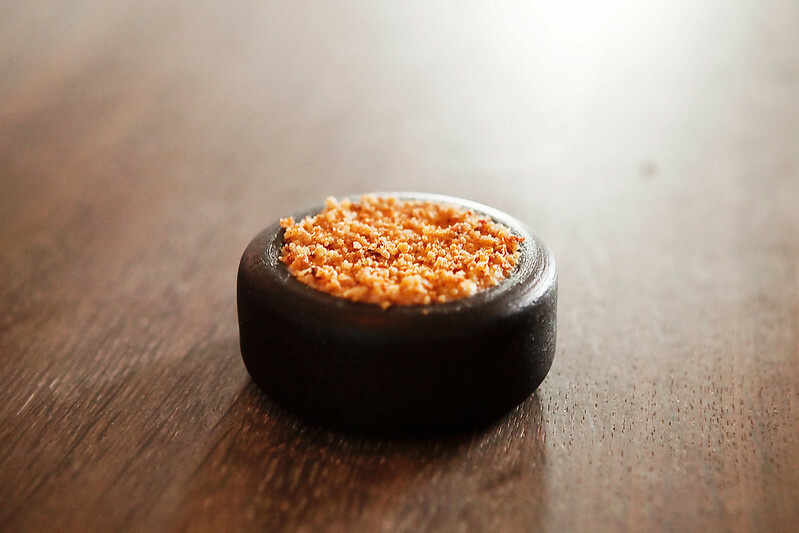 Carrot and truffle – Believe it or not, this carrot has been underground for at least six months. 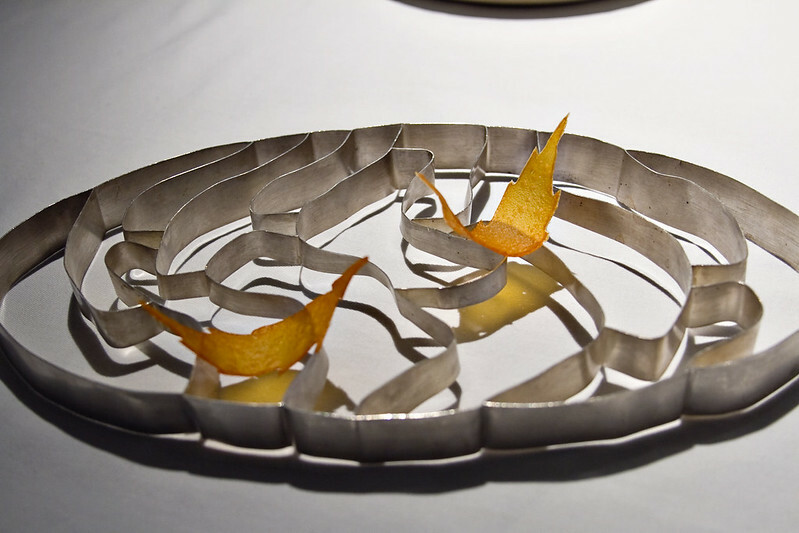 It was slowcooked over goat butter for hours, served on top of Swedish truffle puree, and garnished with carrot stems. The carrot had a rich taste to it that went really well with the subtle flavor of the truffle sauce. 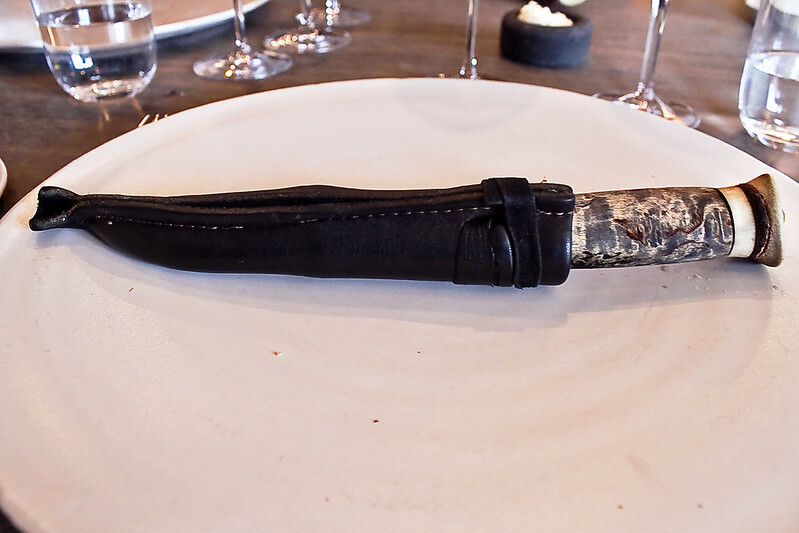 Wild duck served with pear and burnt kale puree – We were each given a curious haunting knife. Our server said that we would need it for our next dish. Moments later, this beautifully arranged plate came out. It contained pieces of duck garnished with thinly sliced pear and kale puree. The duck was gamey and wild for sure. Together with the sweetness of the pear and the earthiness of the kale puree, this dish was one for the books! I’ve never really been a fan of duck dishes, but I am definitely a fan of this one. Blueberries and ants – Our very first dessert course. I must admit, this was one of the dishes that I was looking forward to after reading a bunch of articles about Noma before this trip. These were ice cream sandwiches made with blue berry jam and sorbet, juniper, and pine shoots! Served alongside were leaves stuffed with blueberry jam and ant paste! It’s another one of those “who would have thought you can use ants as one of your ingredients?” The sandwiches came in very crunchy. They were part from the blueberries with a trace of sweetness. Overall, the dish was scrumptious and enjoyable. 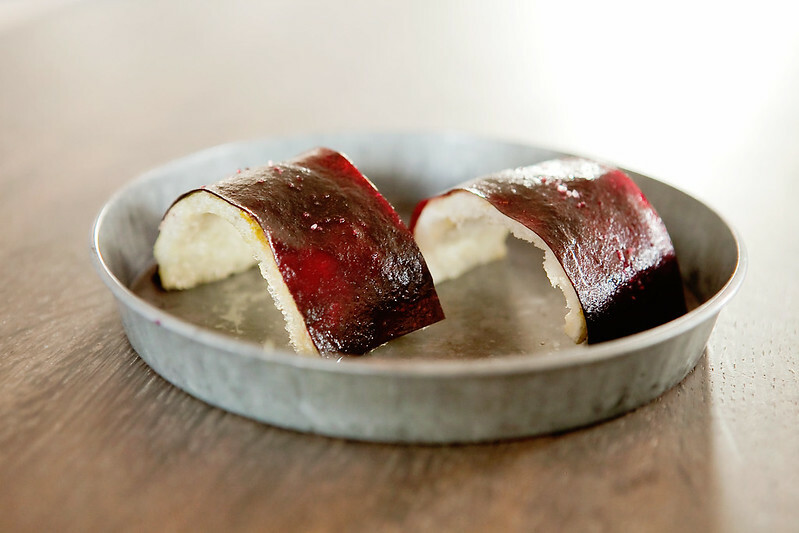 Potatoes and plums – This dish highlighted plums that have been dehydrated for four days so that they could make compote out of it. The compote was so soft and gooey, alongside with potato puree. Both to be eaten with crème fraiche made of plum seeds. 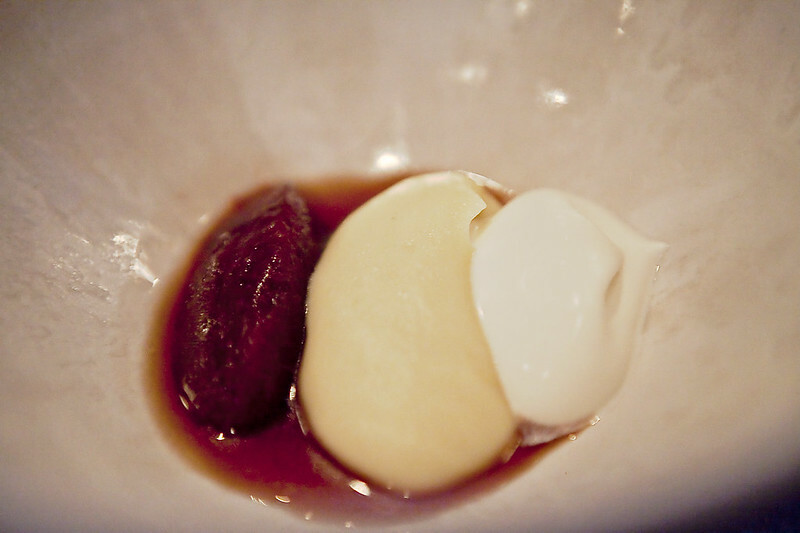 The plum compote was a bit tart but the taste was neutralized by the earthy goodness of the potato puree. Each sinful bite brings us closer and closer to our own definition of dessert heaven. 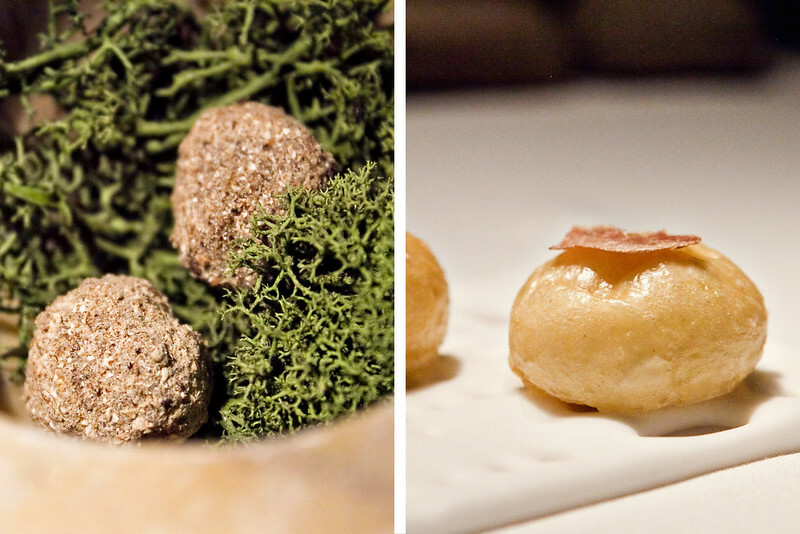 As you may know, any tasting menus won’t be complete without the restaurant’s array of petit fours. 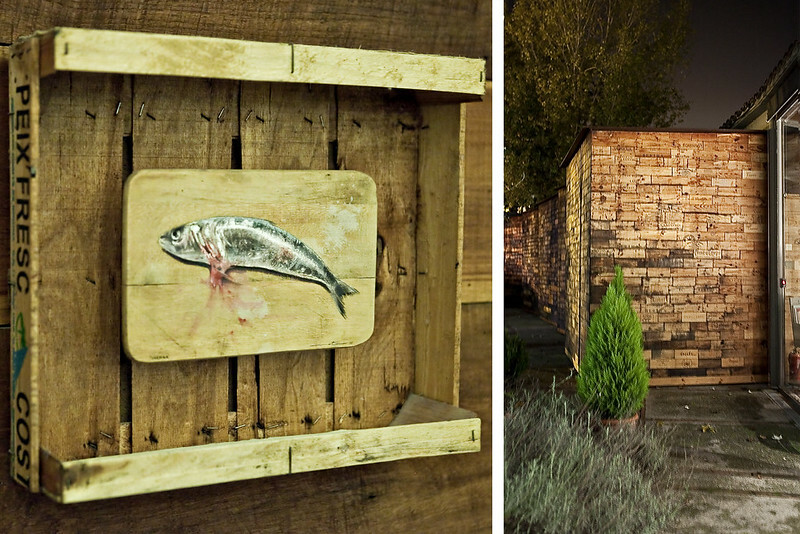 Noma’s version was no different than their mains – innovative, artistic and delectable. Not to mention that they move you to a cozier place of the restaurant, surrounded by fur rugs and throws and lit mainly by candles. Caramel – This dish was all about the caramel fudge turned into what seemed to be pieces of bread. Do not be fooled though, these pieces were actually soft, chewy and quick-to-melt! 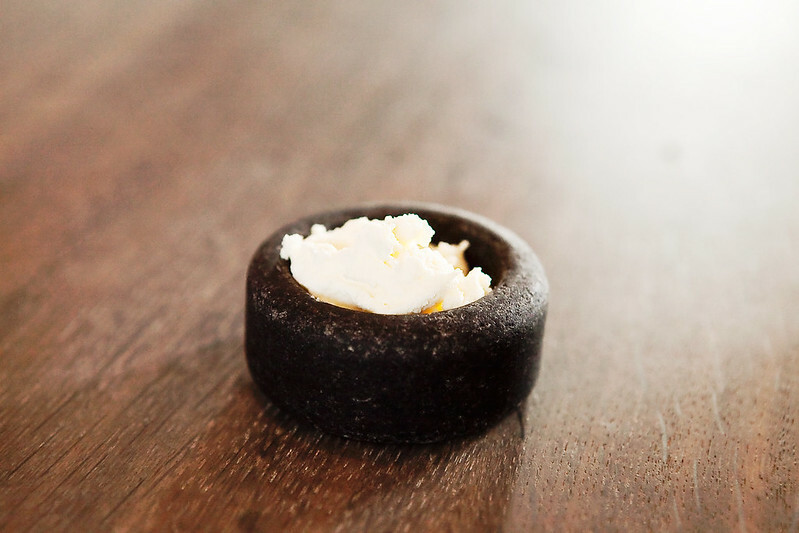 We ate this with seabuckthorn spread and elderflower salt. 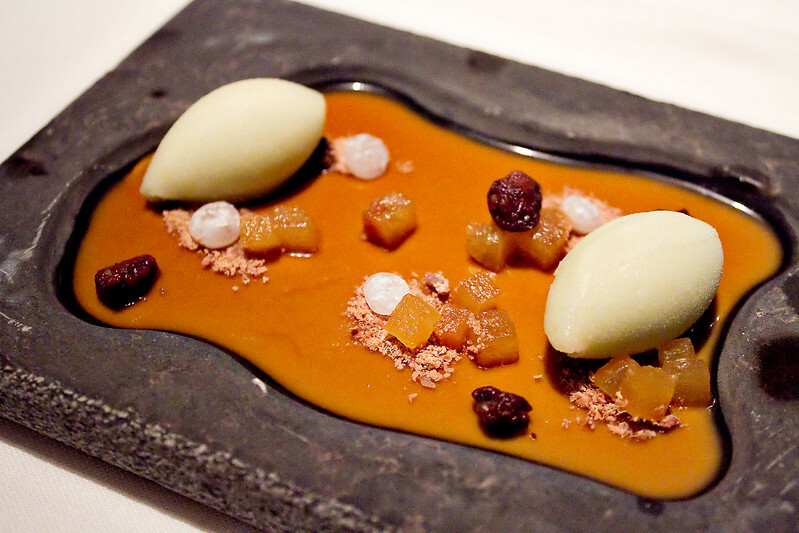 Yes, it was Noma’s take on salted caramel, except that it’s much more creative and enjoyable. 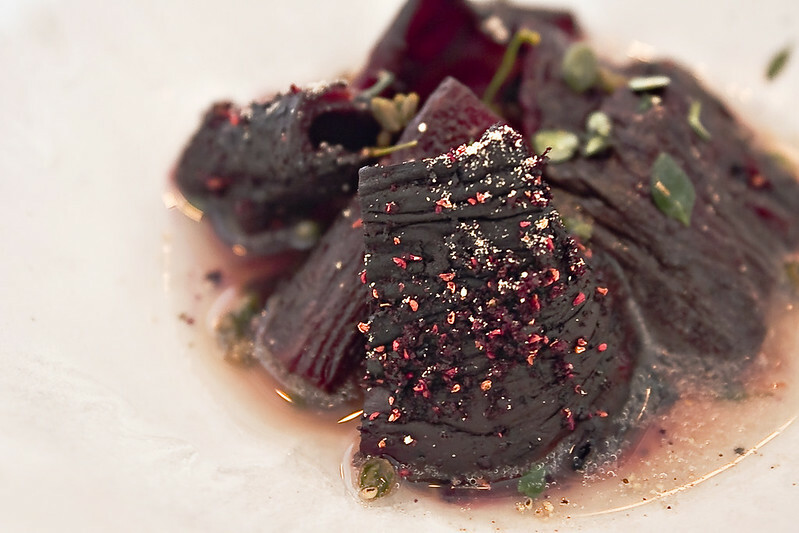 Beetroot with licorice – Sweet chewy candies. They do not disappoint like the others! Potato chips – Chocolate covered potato chips sprinkled with fennel seeds. Each chip gave out a bittersweet taste with a hint of spice from the seeds. Chef Matthew Orlando (Noma’s Head Chef at the time of our visit), approached us and asked if we wanted a tour of the kitchen. We were not passing up on this opportunity so we immediately said yes. He brought us to various parts of the kitchen including the upstairs facility where they have the staff room as well as the corner where they “invent” test dishes. Everybody was busy doing their work with smiles on their faces. 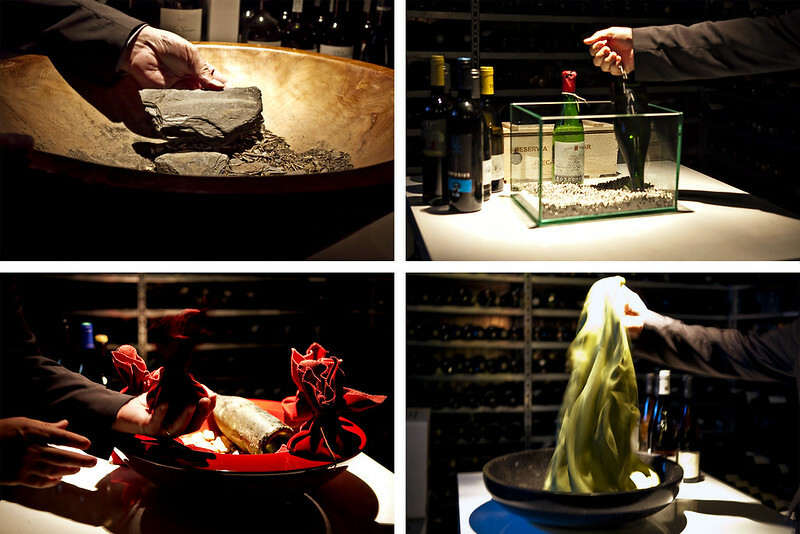 The passion of creating something for its patrons and making the experience exceptional are what makes Noma one of the best restaurants in the world! 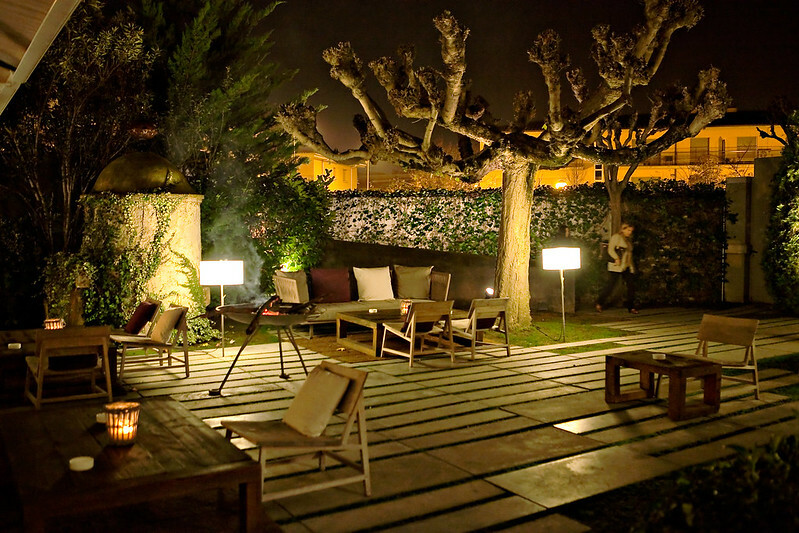 Being here was one of the most unforgettable dining experience we’ve ever had to date bar none. The food was amazing and the service was excellent! 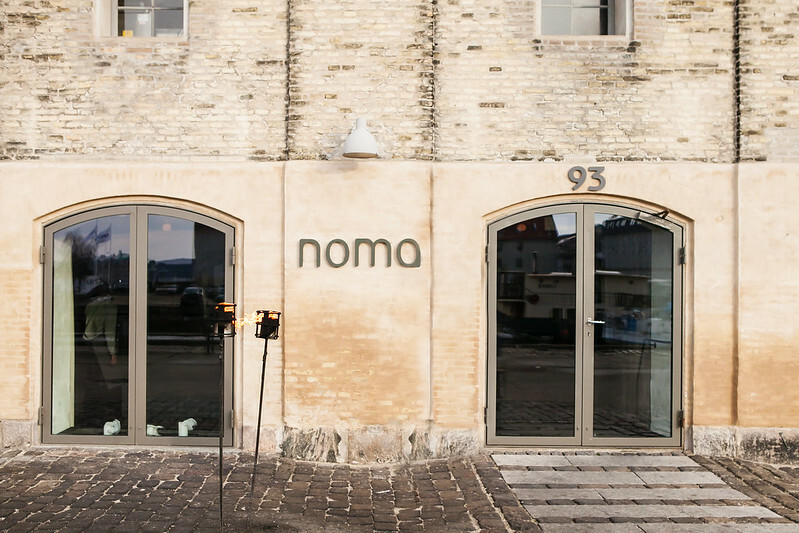 Thank you Noma for being what we had imagined you to be and so much more! It was a chilly morning when we arrived in Copenhagen. A crisp breeze and green scenery welcomed us as we rode a cab to our hotel. We had 2 hours to kill until our 1pm reservation at the World’s No. 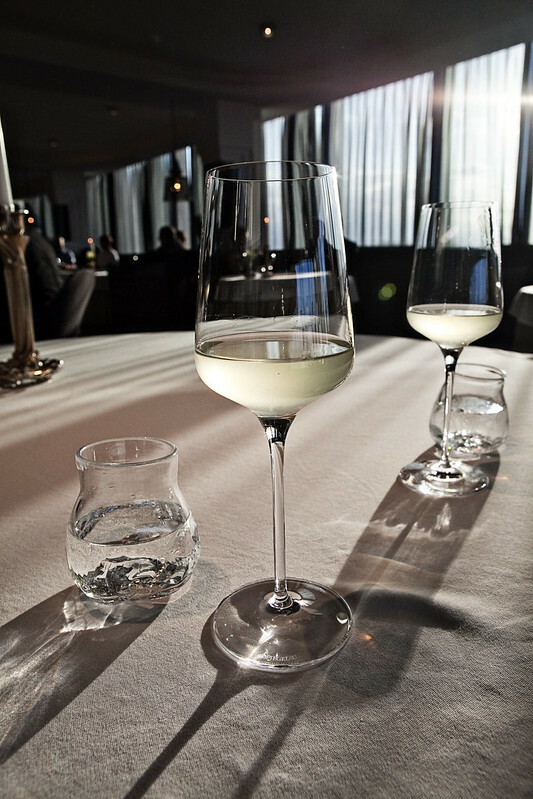 1 Restaurant in the World according to San Pellegrino’s 2012 List, and yet we couldn’t contain our excitement. Half an hour before our reservation we hopped in another cab. The driver took us off the beaten track, stopping a few steps away from what looked like an old warehouse right by the docks opposite Nyhavn. 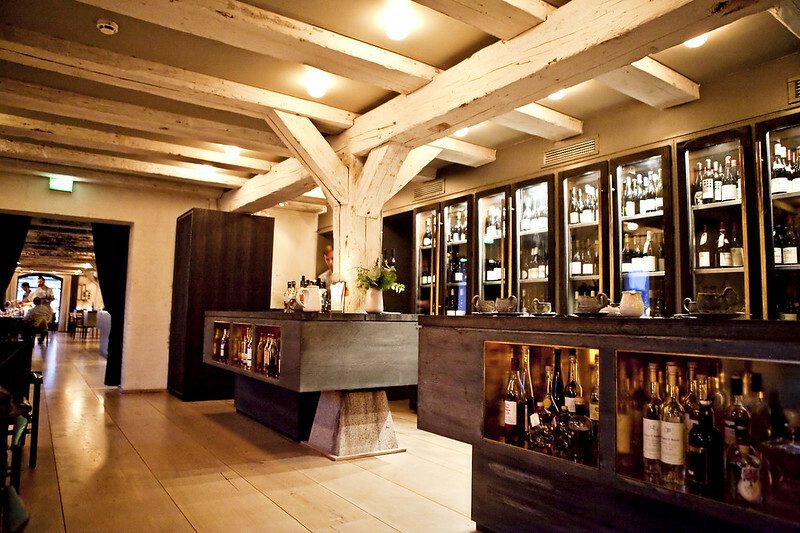 The restaurant’s location and ambiance were different than Geranium’s, another Copenhagen restaurant in the San Pellegrino list which have been to as well. 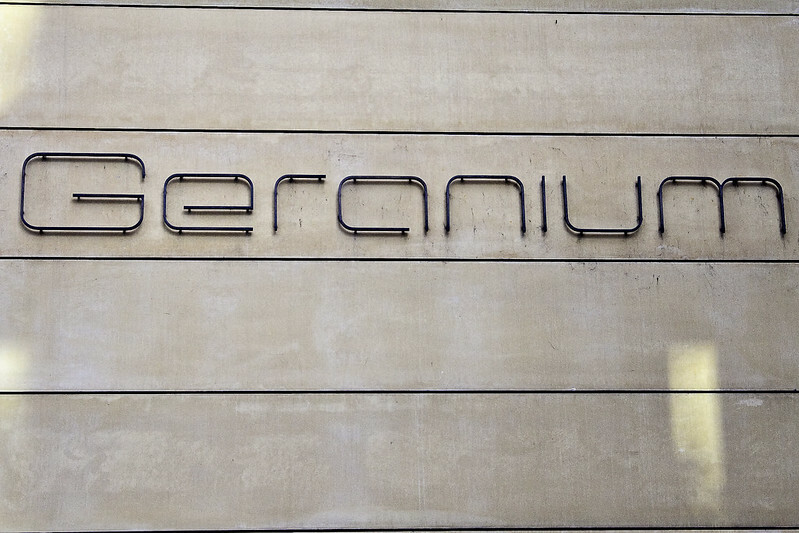 Although we truly enjoyed our experience at Geranium, we were ready for something different. Staff ten deep in the reception area warmly greeted us as we made our way inside. When we got to our table, one of the chefs asked us if there’s anything we don’t eat and told us to be prepared for some “surprises.” Exactly what we wanted to hear. 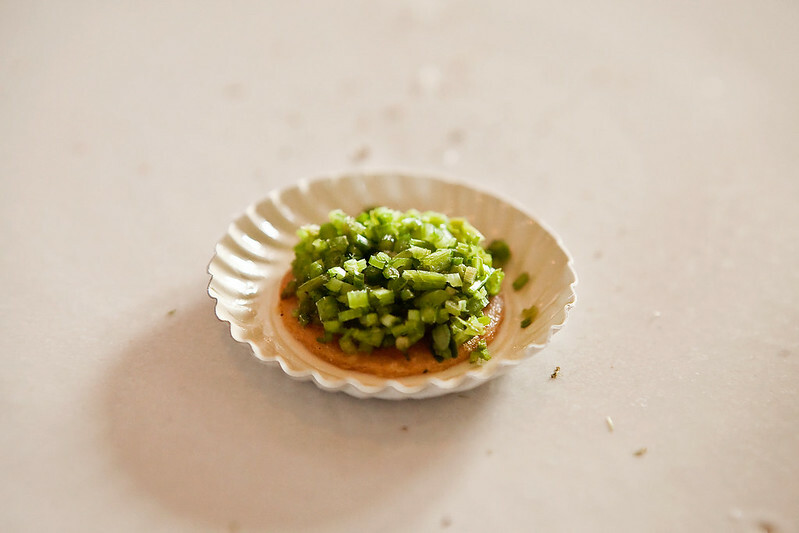 Similar to the other tasting menus we’ve had, we were started off with the amuse bouche. 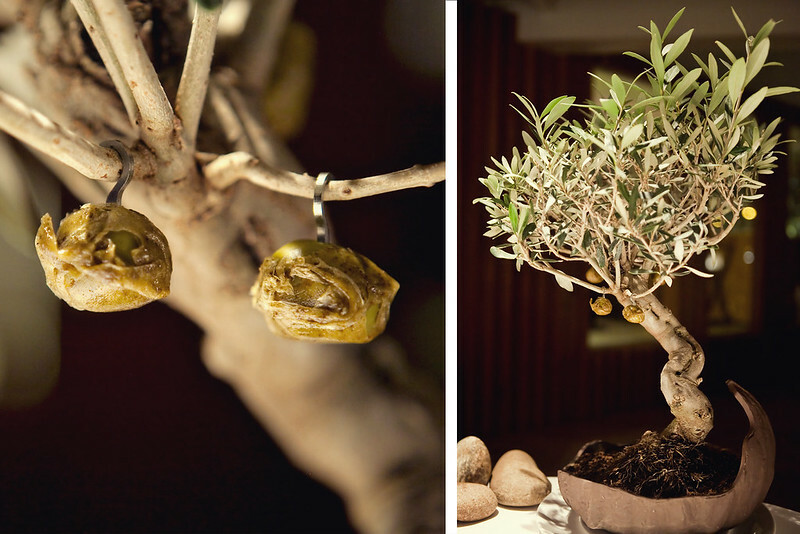 The very first one came from an unassuming vase filled with leaves, tiny flowers, and twigs. 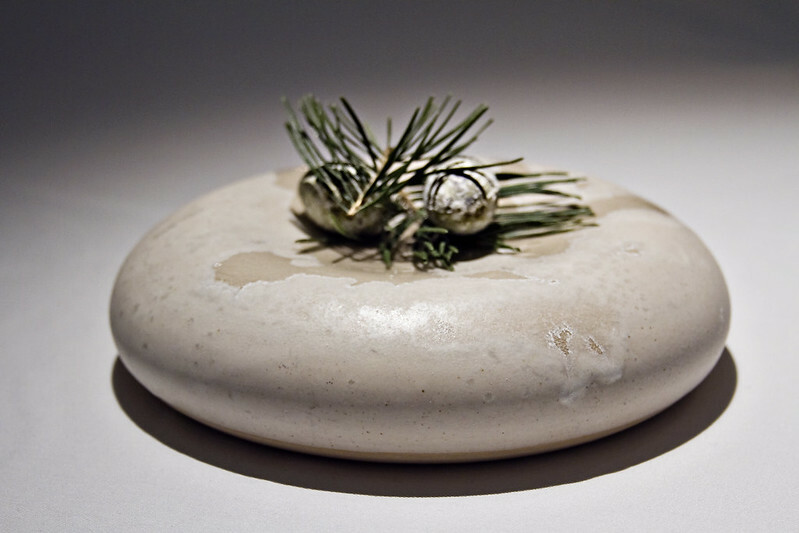 Malt flatbread and juniper – One of the chefs brought out crème fraiche and asked us to pick the “twigs” from the vase. 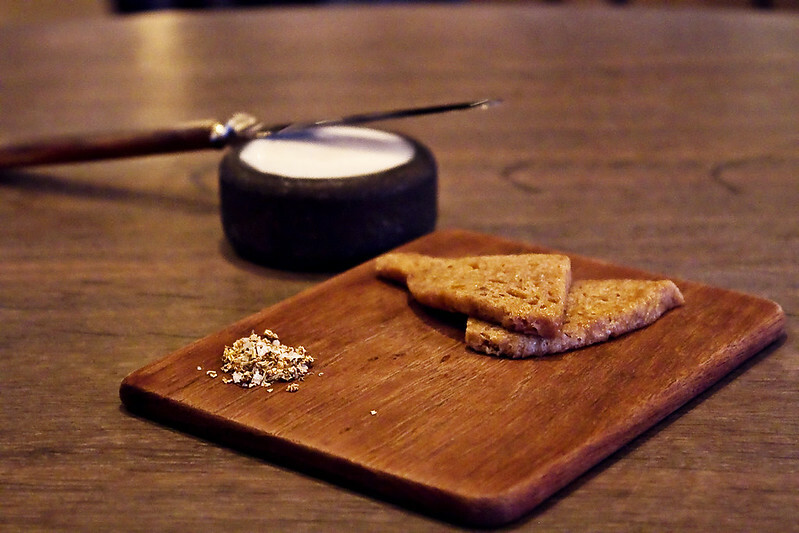 It turned out that the twigs were made of flatbread baked to crisp and dashed with juniper.The crème fraiche was heavy cream that had a hint of sourness to it. 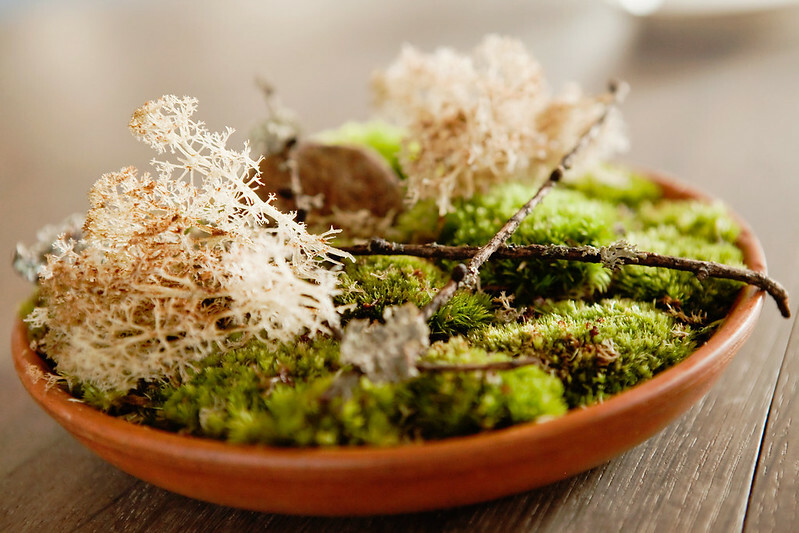 Moss and cep – A seasonal dish mainly because the main ingredient, fresh reindeer moss, only grows during winter. 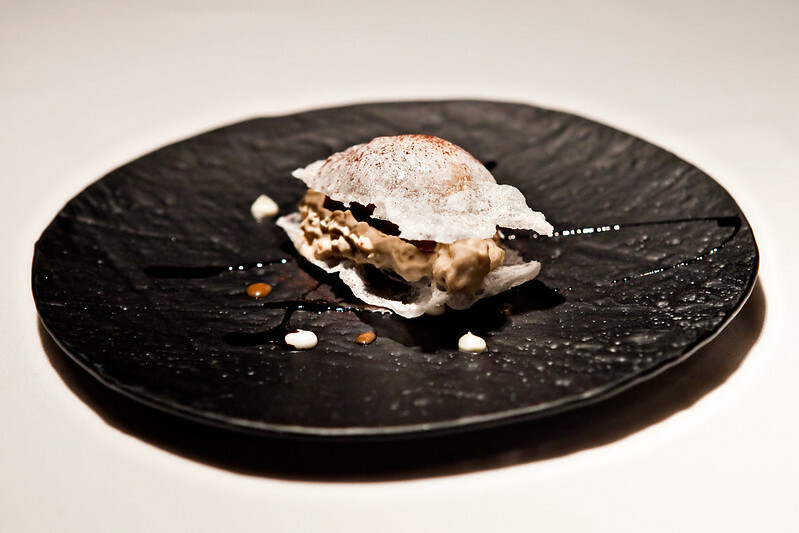 The moss was fried and made crispy dusted with powdered cep. For those with curious minds, cep is a type of mushroom better known as porcini. 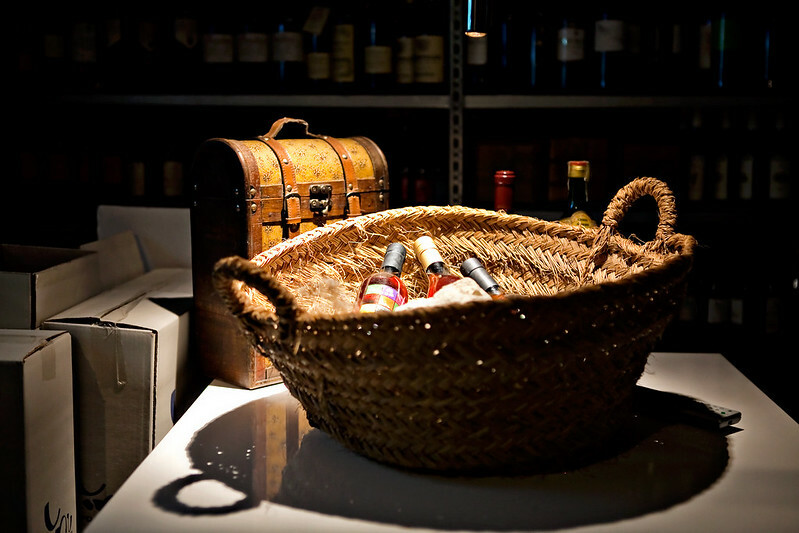 It is supposed to be highly valued by chefs and gourmets according to BBC Food. The whole dish was scrumptious and had an earthy taste to it. 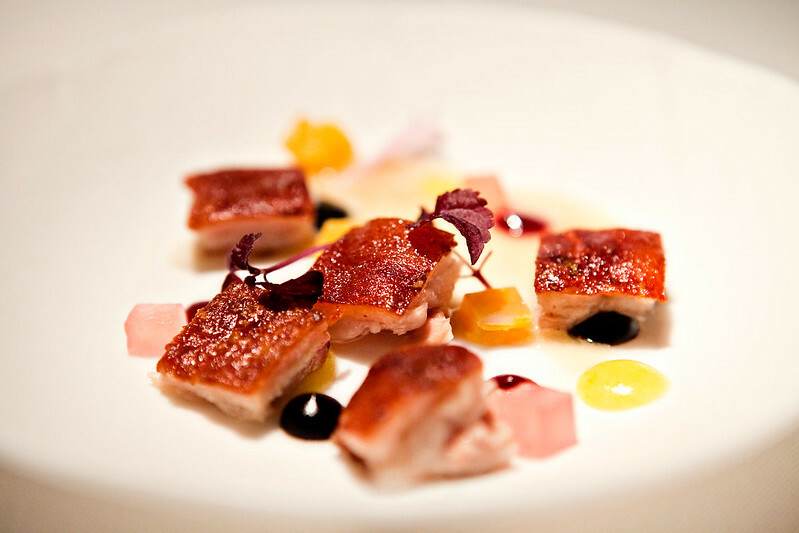 Crispy pork skin and black currant – They were not your ordinary fried crispy pork rind as they were served with black currant leather on top of each piece. 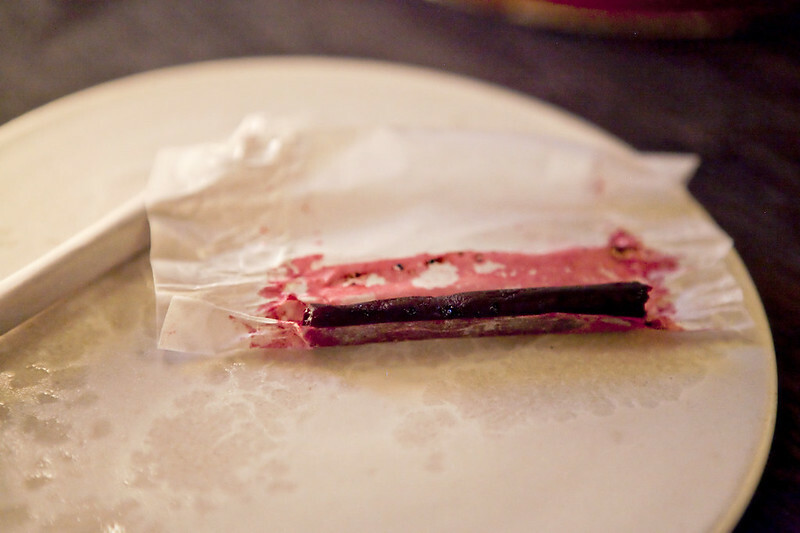 We were told that the chefs had to juice pieces of black currant and left them to dry into pieces of delicate strips with texture similar to leather. Each heavenly bite gives off a tangy taste from the black currant set off by the salty and fatty taste of the pork rind. The dish was not only creative but also delicious. 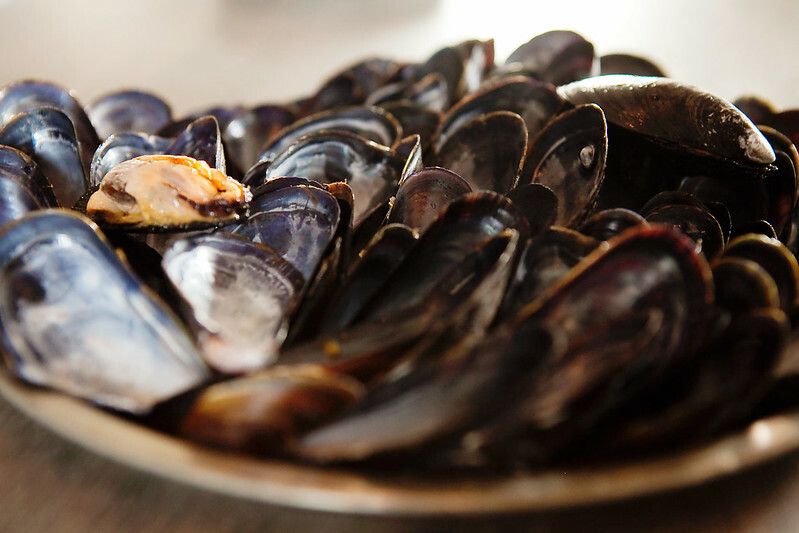 Blue mussel and celery – Two pieces of blue mussels stuck out from a beautiful plate full of blue mussel shells. As we each picked up a piece, the chef told us that we could eat the bottom shell. Dumbfounded, we ate as we were told. We later found out that the edible shells were made of squid ink crusts. The mussels were fresh and briny. 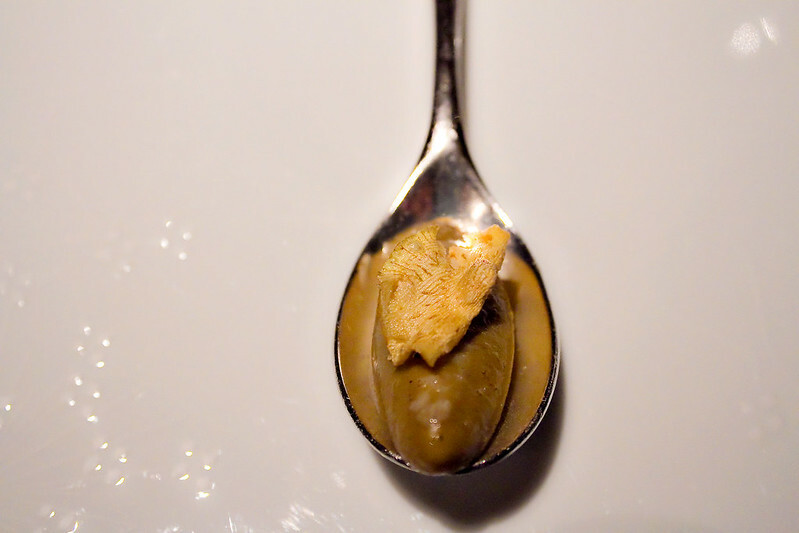 The creamy celery sauce added to the mussel made it seem as if we were actually eating something fresh out of the sea. 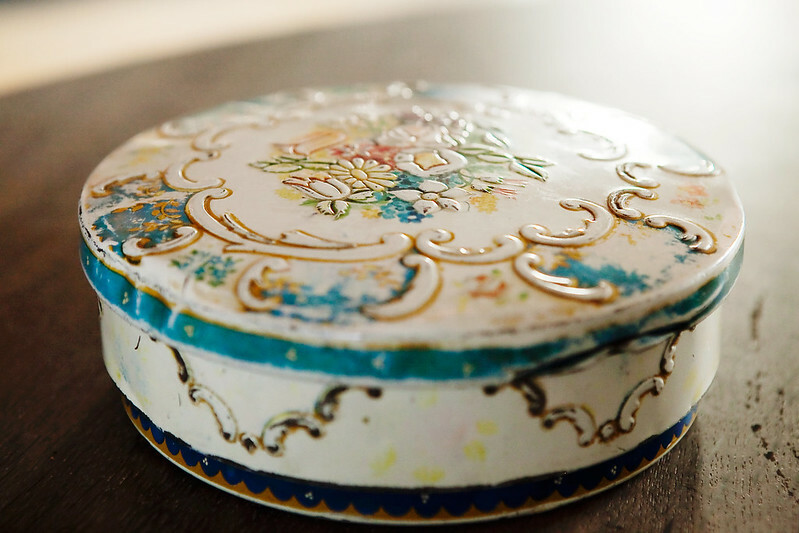 Cheese cookie, rocket and stems – Placed inside a pretty tin can were tiny cheese cookies topped with chopped stems of some fresh herb. The sweet and salty play of this dish was simply amazing! P.S. Be careful not to eat the under wrapper as they are not edible. 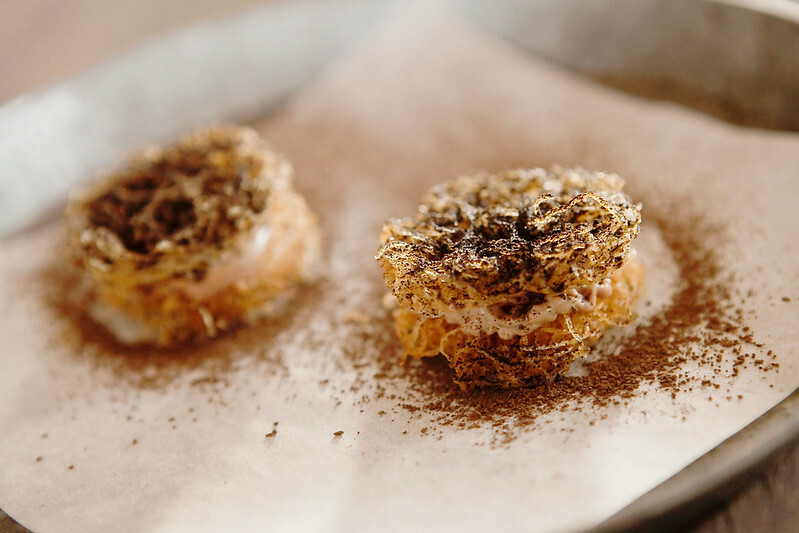 Potato and duck liver – This savory dish featured potatoes shredded into strands lumped together to form two small crispy buns seasoned with powdered black trumpets mushroom. Between each bun was duck liver cream. 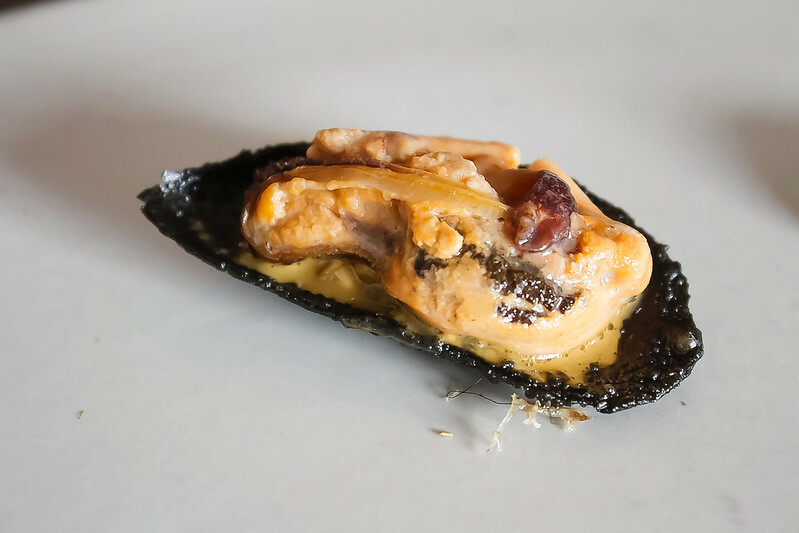 The prominent taste was that of the duck liver, rich, buttery and delicate and subtler than the taste of foie gras, combined with the smoky flavor of the powdered black trumpets. 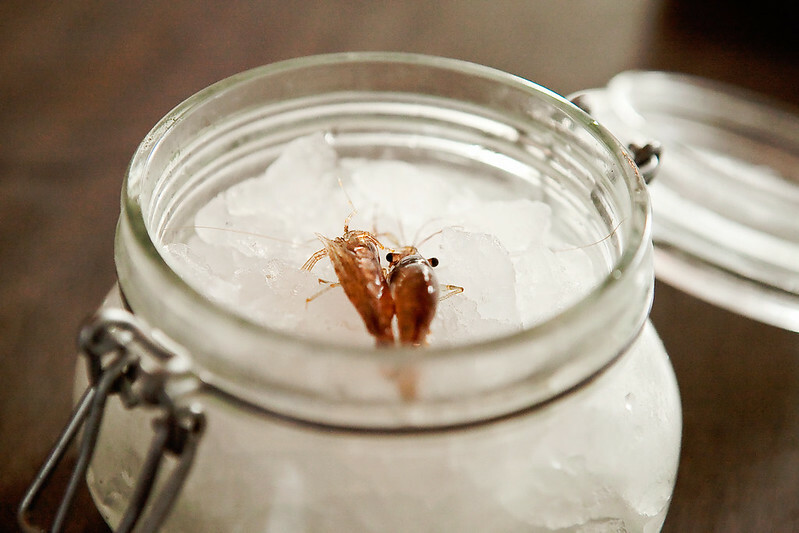 Shrimp and butter – The chef was not kidding when he said that the shrimps inside a kilner jar on top of the ice cubes were fresh. As we picked up each piece, the shrimp started moving making it hard for us to get a hold of it. We didn’t know what to expect in terms of taste, as I’m not sure if I would like it.Nonetheless, I grabbed the shrimp firmer this time around and dipped it in the brown butter sauce that came with it.Surprisingly, I thought the shrimp with the dipping sauce tasted sweet, pure and exquisite. For a moment there, I considered asking for a second serving! 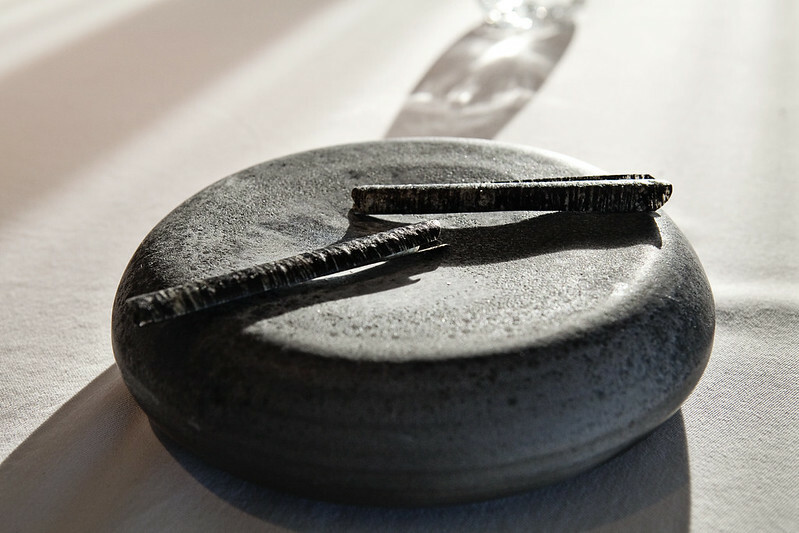 Dried carrot and sorrel – Sticks of dehydrated carrots were served on top of hay ash. 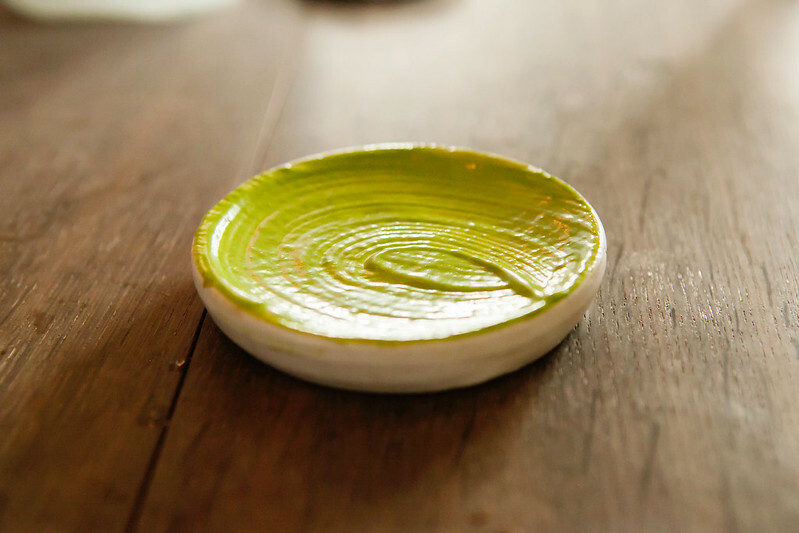 A plate of tangy sorrel paste also came together with the dish as a dipping sauce. 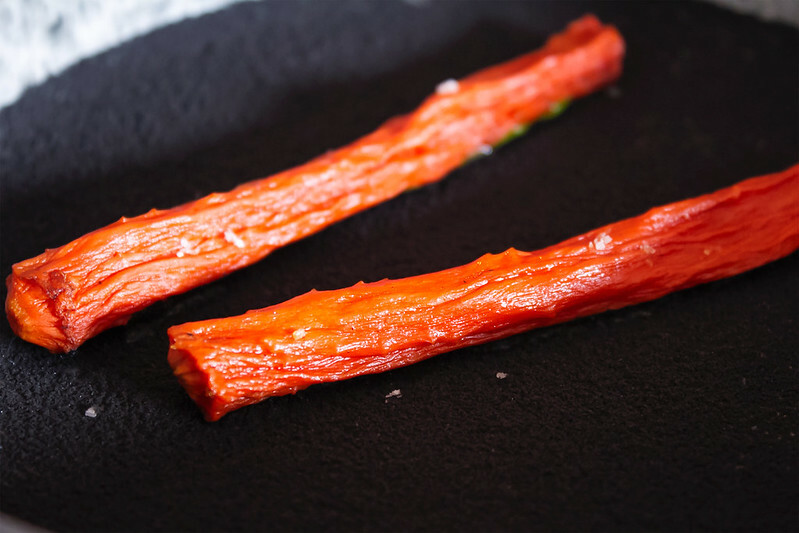 After being dehydrated for several hours, the carrots were slow roasted making each stick extremely flavorful, with a trace of sweetness, while giving it a chewy texture. 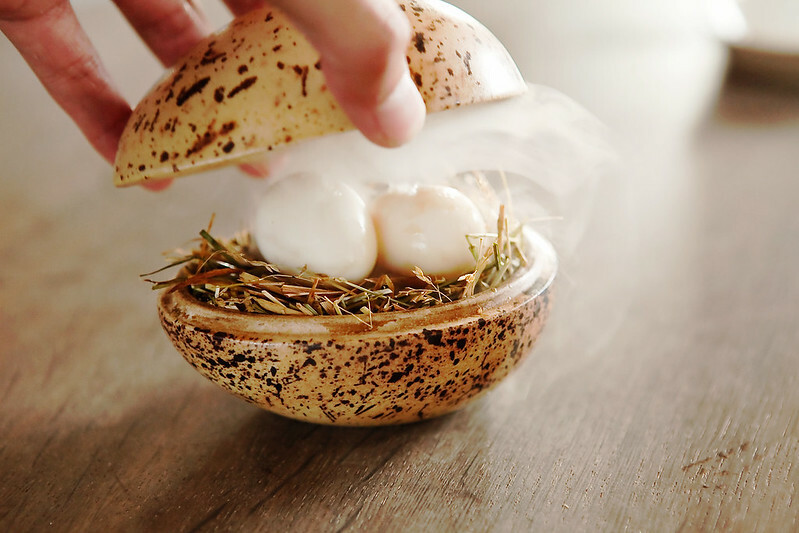 Pickled and smoked quail eggs – A porcelain egg-shaped container was placed right in front of us.As we opened the lid, a fragrant aroma of burnt hay leaves started to drift away. The inside of the container revealed two pickled and smoked quail eggs. As we swallowed an egg, a burst of warm velvety liquid exploded in our mouths, which we assumed to be the yolk. These eggs were truly delectable. 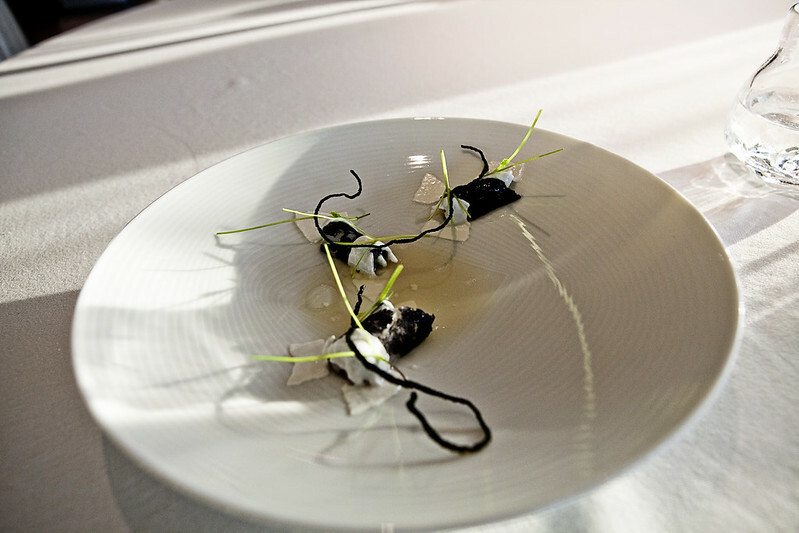 Radish, soil, and grass – Creativity at its finest. 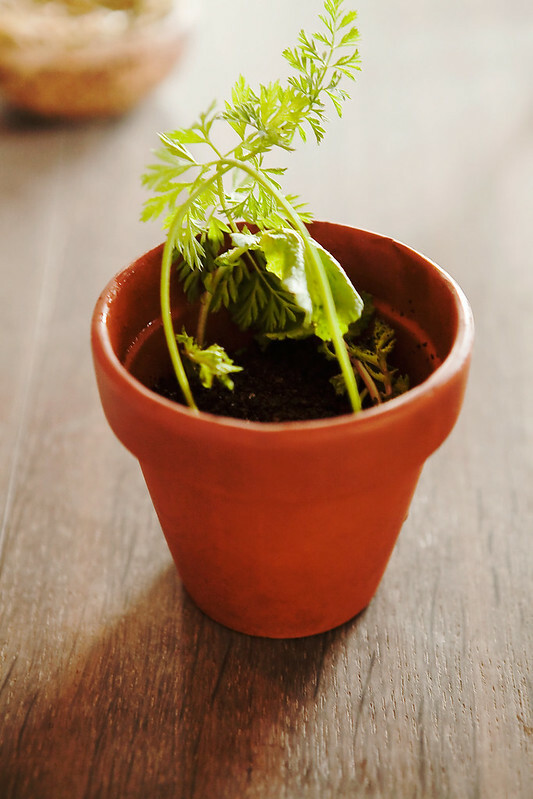 Our next dish came to us in a form of a small terracotta pot in which it looked like some kind of vegetable was growing from the soil. We were told to “dig in;” a phrase that had to be taken both figuratively and literally. And so we got our hands dirty, by first pulling out the vegetable stem from the soil. We were surprised to see a tiny piece of radish from the other end of the stem. Each radish was slightly bitter when eaten by itself but it becomes a different story when eaten with “soil.” The “soil” inside the pot was made from malt, hazelnut crumble, asparagus and creamy yogurt. 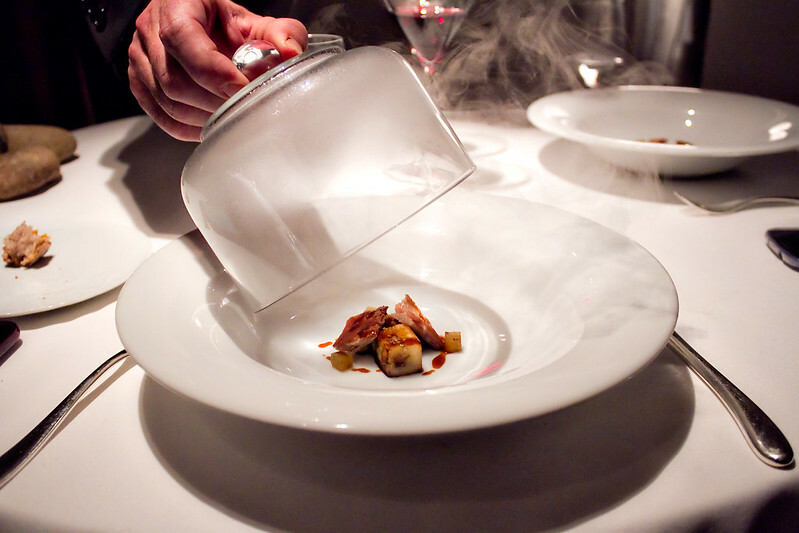 Everything about this dish was not only visually enticing but also mouthwatering. Sorrel leaves and cricket paste – One of the chefs told us that our next dish would consist of fermented crickets and grasshoppers. 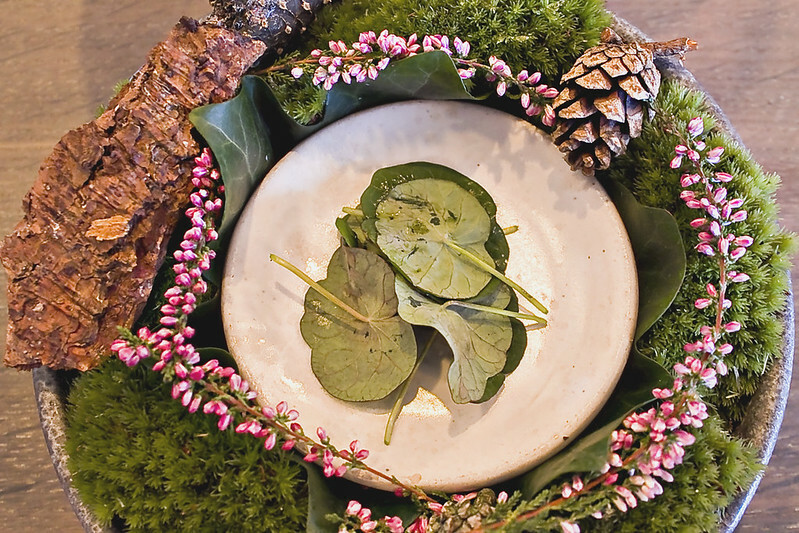 With that, two sorrel leaves standing on a frozen block of ice within a bowl were placed in front of us. Curious to know how crickets and grasshoppers made their way into our dish, we each plucked a leaf and unfolded it to see if there were any visible traces of these insects. To our disappointment, there were none. Seemed like they were turned into a green paste instead. The green icy bits on top of the block of ice, beneath the sorrel leaves, were icy nasturtium. 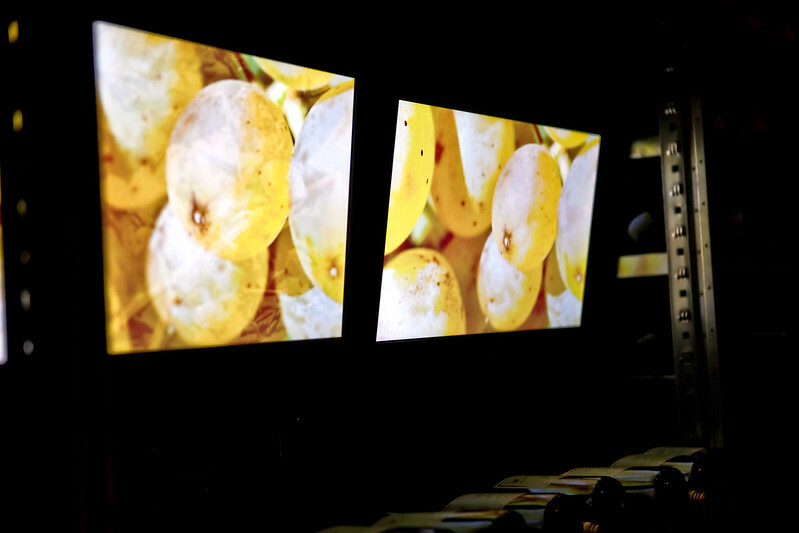 Each bite of the leaves presents a pungent, nutty and leafy taste. It was an enjoyable dish. 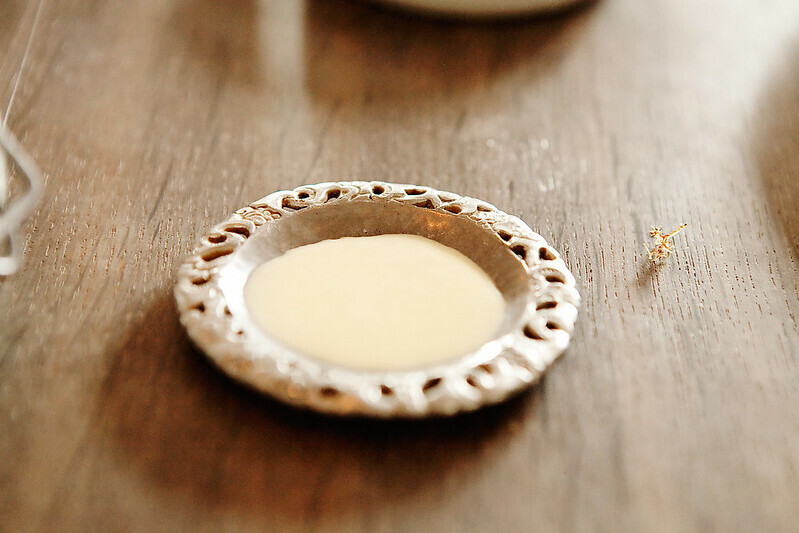 The mere fact that we were somehow eating insects definitely added to the fun! Leek and cod roe – Don’t be fooled by the exterior of these leeks into thinking that the next dish would taste like burnt stems. On the contrary, these were probably the best tasting leeks we’ve ever had to date. The inside of the leeks were soft and tasty intensified by the slightly salty cod roe slathered on them. 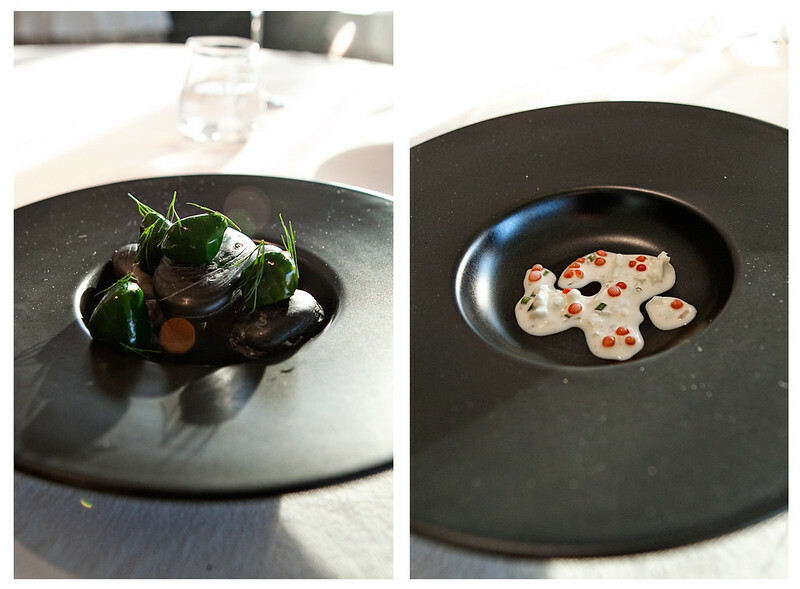 After 12 small portions of beautiful and absolutely tasty dishes, that summed up the chef’s amuse bouche. 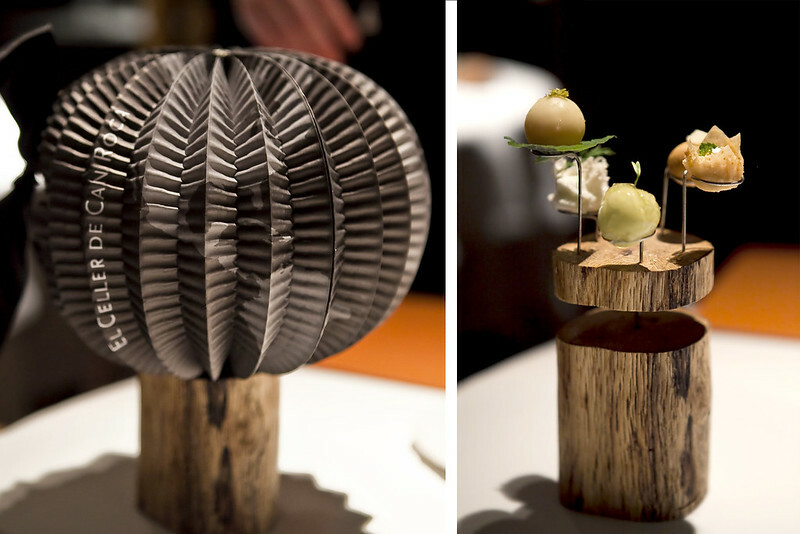 On my next post, I will take you through the mouthwatering appetizers and main courses of Noma’s seasonal tasting menu. 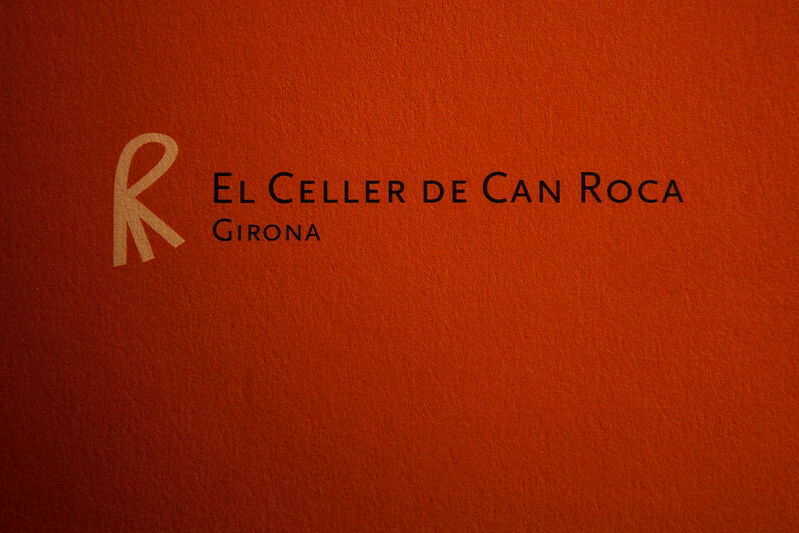 This is the continuation of our two-part feature on El Celler De Can Roca. 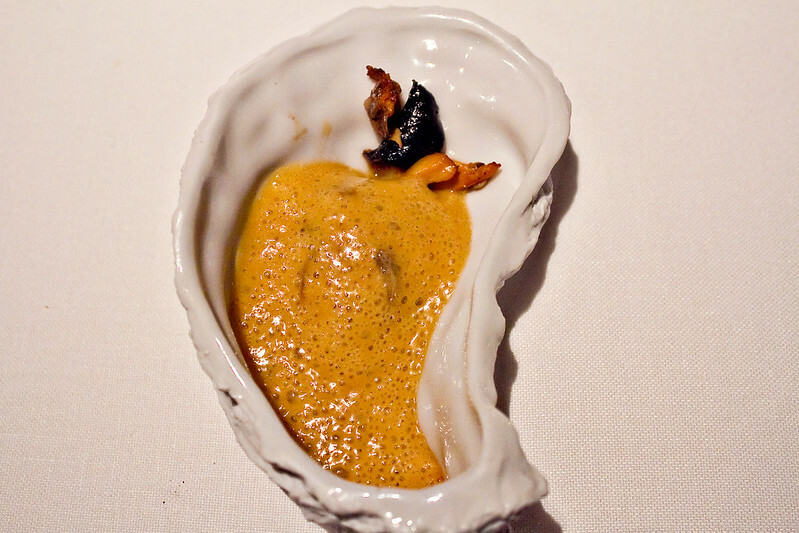 We were so pleased with the amuse bouche and the appetizers, that we could only expect better dishes from here on. 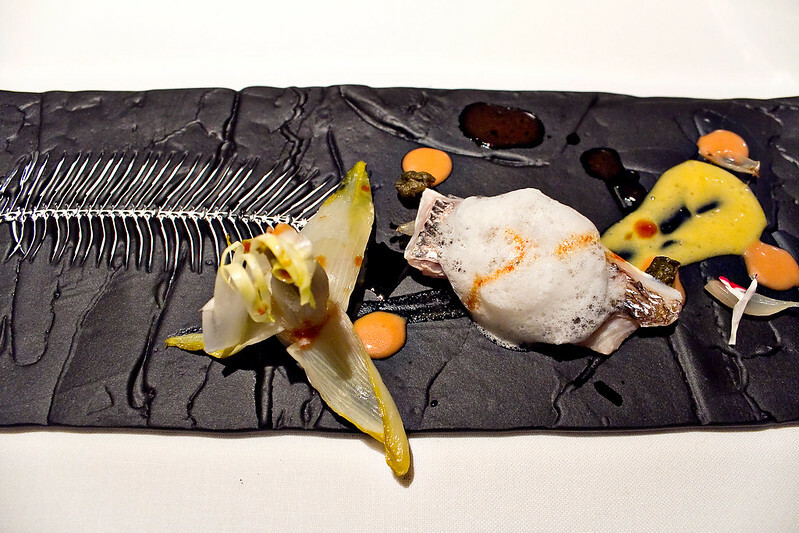 Red Sea Bream with Endive, Gentian, and Citrus: In addition to its elaborate presentation, this dish features a very tender and savory red sea bream garnished with a caper on top of an endive. The sauce was tangy and sweet, prepared from extracts of mandarin and oranges. Salt-Cod Brandade: This dish was made of braised salt cod, salt cod foam, olive oil soup, shallots and honey, thyme and chili pepper. The fish was tender and the sauce was a creamy and delicious emulsion of salt cod and olive oil. Iberian Suckling Pig Blanquette with Riesling: One of the prettiest dishes of the night came in a platter featuring small cuts of pork belly cooked to perfection as well as the restaurant’s recreation of Riesling wine. 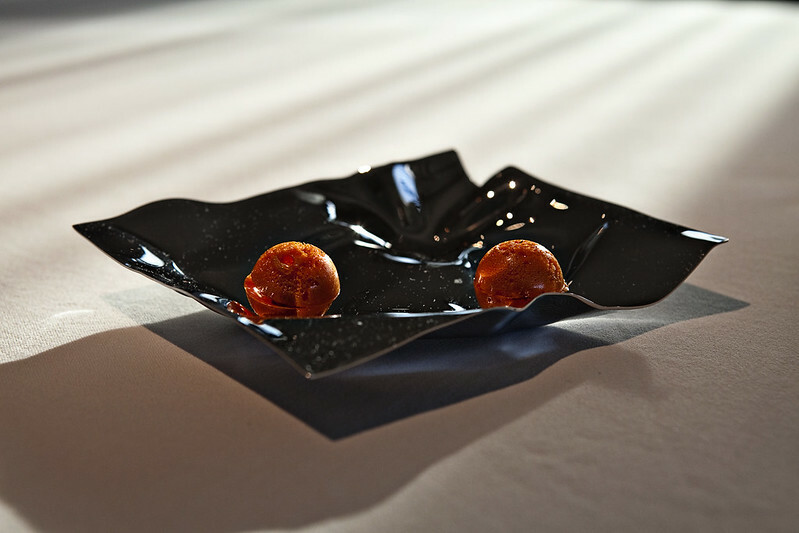 The jellied dots and cubes were made of various purees and a concentrate of mango terrine, melon, beetroot, black garlic, and orange made to resemble the taste of Riesling wine. 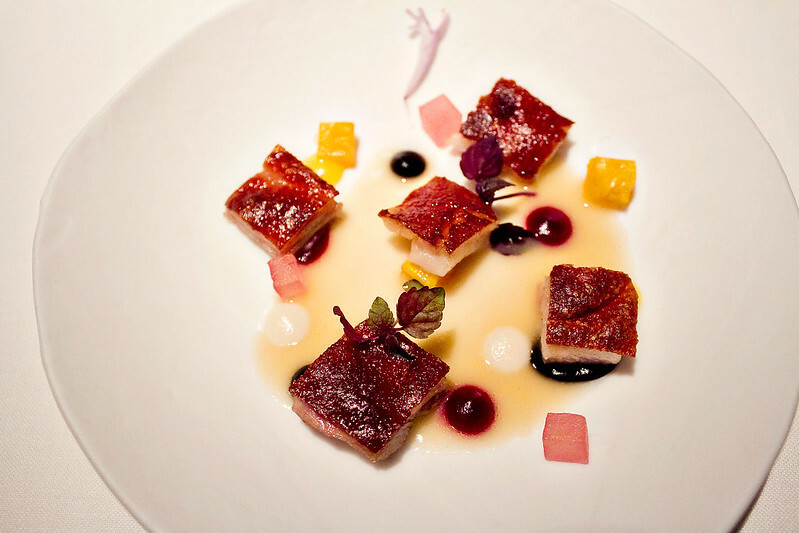 The acidity from the jellies and the clear sauce harmonizes with the hint of sweetness from the pork. We saved the oregano flower at the end to freshen our taste buds. Everything about this dish was divine. 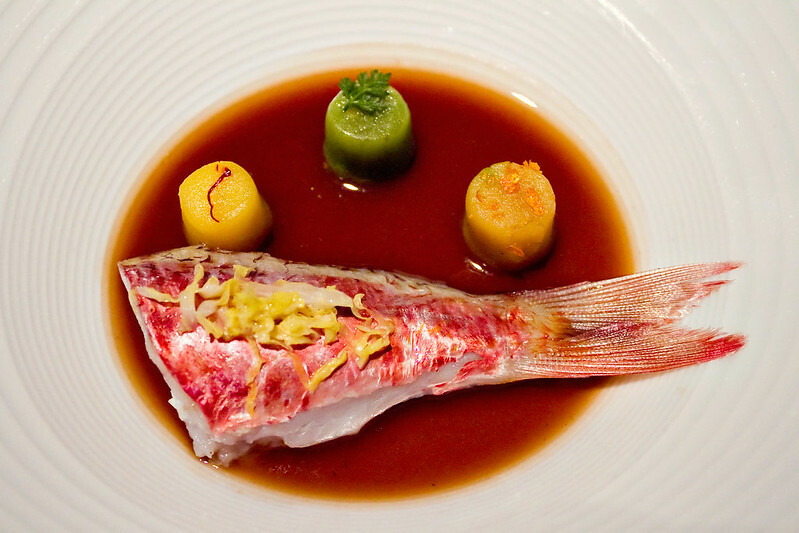 Red Mullet: Cooked sous vide style, the fish was very soft and exquisite. It was served on a light and tasty broth together with sweet and zesty-tasting gnocchis made of orange, fennel and saffron. 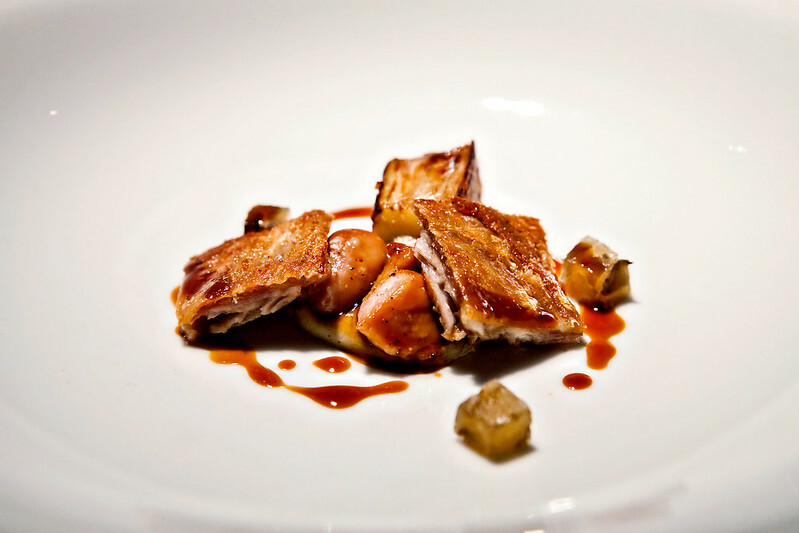 Charcoal-grilled lamb breast fillet and sweetbreads with eggplant, coffee, and liquorice. As our server opened the bell-shape jar covering our dishes, a smoky aroma of barbeque started to slip away. On our plate were tender portions of lamb breast with crispy skin and morsels of sweetbreads. Everything was scrumptious and gone in a matter of minutes! 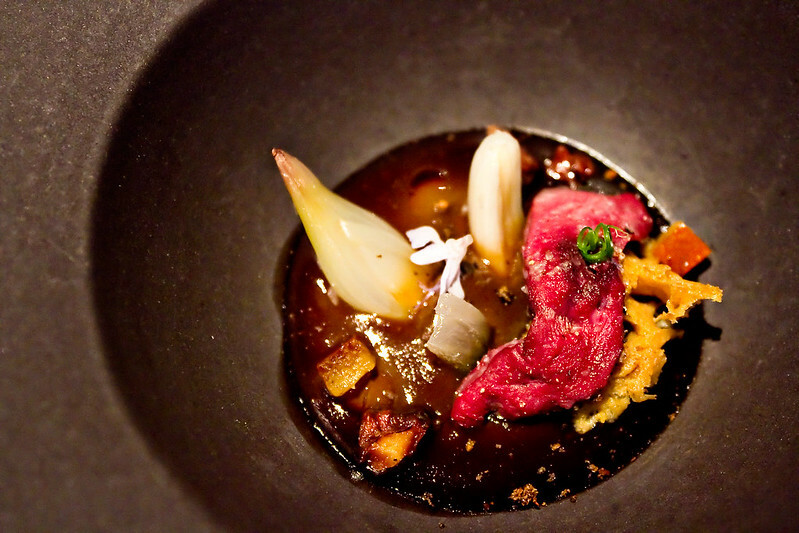 Wood-pigeon liver with onion, curry-caramelized walnuts, juniper, orange peel and herbs: The liver itself had a robust metallic taste. The sauce was thick and tangy but also had a strong taste of onions. That concluded our main courses at just the right timing. We didn't want to get too full before the desserts. So after what seemed an eternity waiting in anticipation, our first dessert platter came. Maple Syrup Cream with Pear, Walnut and Cardamom: The maple syrup cream with the pear ice cream worked well together. Each bite was gooey, seeping with heavenly goodness. Somewhere in the dish, there was orange and cardamom that gave a zesty and minty taste complementing the sweetness from both the maple and the pear. 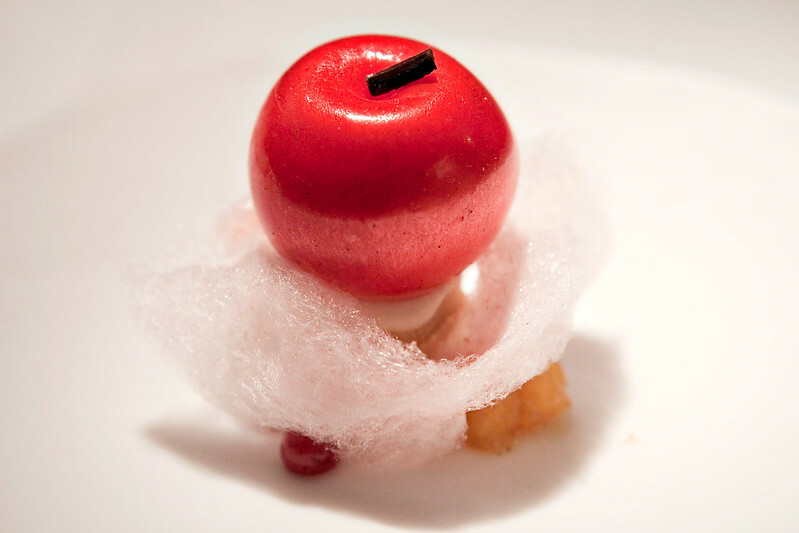 Girona’s Fair Caramelized Apple: The apple that came with this dish was bright red, shiny and sinful! It was served on top of cotton candy and jellied cubes of what we thought were real apple and pomegranate. The whole dish was so delicious; not too sweet. Mocha Mille-Feuille: An interesting version of a mille-feuille. The top layer was sweet and crispy and the ice cream inside had a mixed taste of mocha and anise. If mixed with the syrup that came with it, the mocha taste blended perfectly with that of coffee. We ended our meal at around 1 a.m. 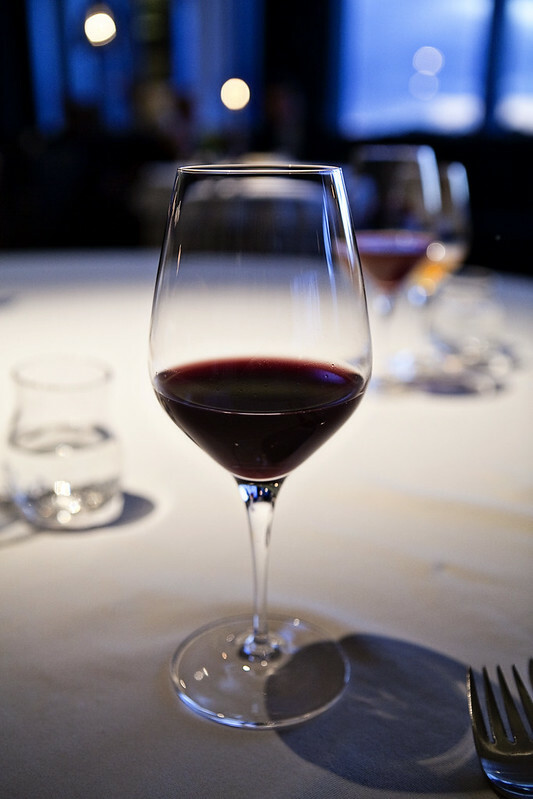 The server asked us if we wanted to stay for coffee and tea but at this point my husband and I were both battling sleepiness as well as the effects of the wine, so we declined. 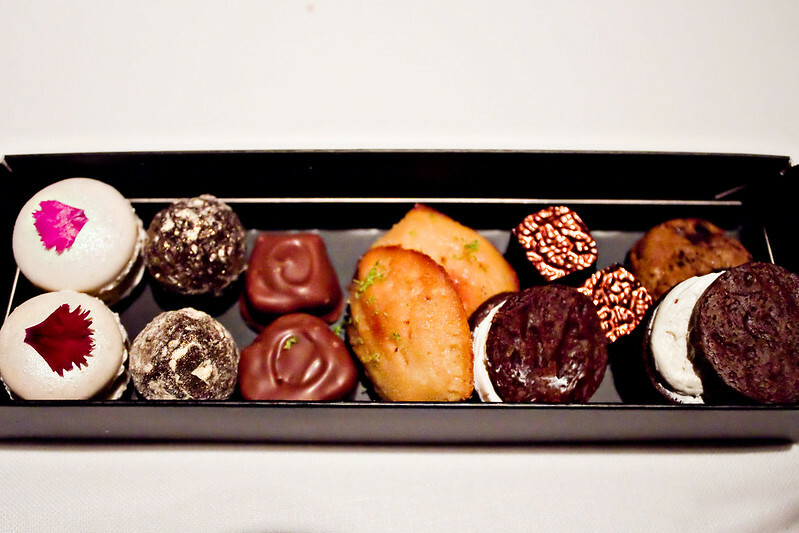 Our server then packed us some petit fours to go. It was such a sweet gesture! The little box she packed for us consisted of (from left to right) mini chocolate chip cookies, chocolate cookies with cream filling, dark chocolates with crunchy bits, madeleines, milk chocolates, ferrero-rocher type chocolates, and macaroons. 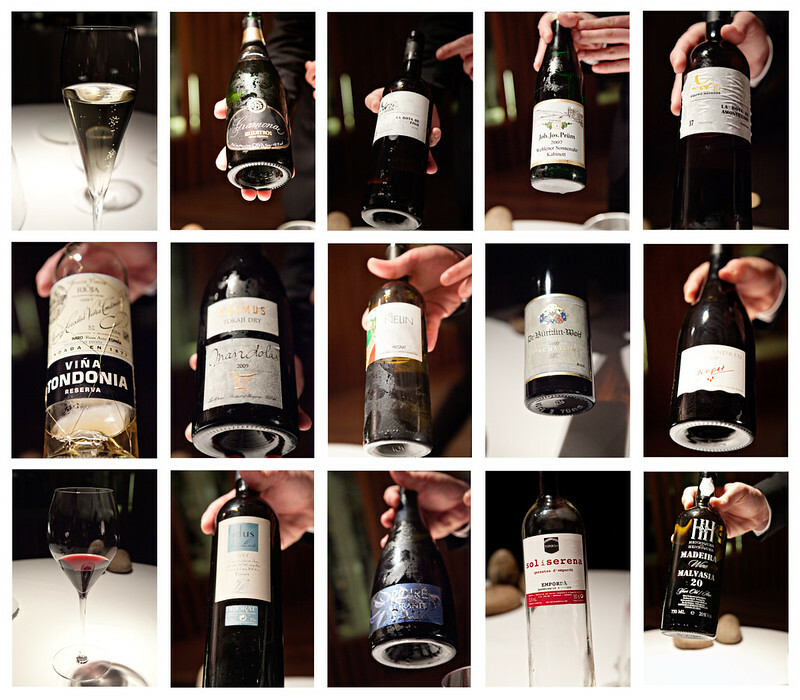 Here are the wines that we were served. There were fifteen bottles in total. They said that the wine we were poured was approximate to at least half a bottle of wine. For us, non-wine drinkers, that was a lot! 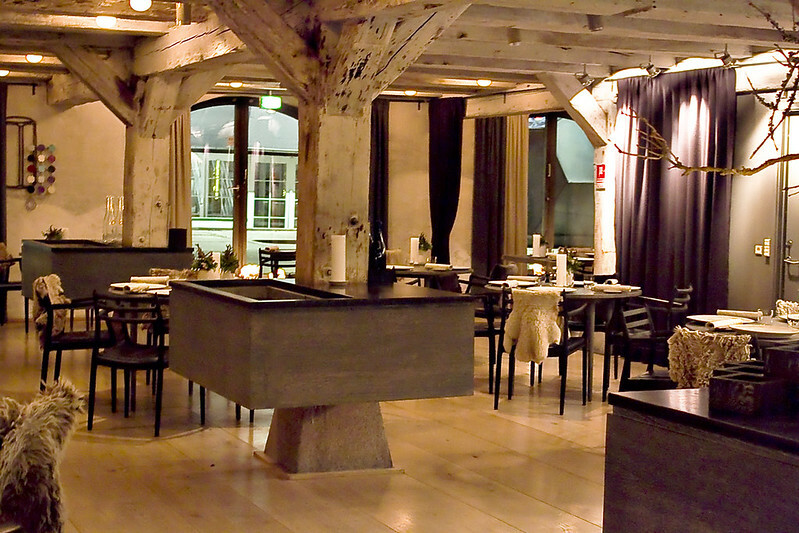 Overall, we loved the food and the experience! And to top it off, our bill wasn’t as expensive as we thought it would be. 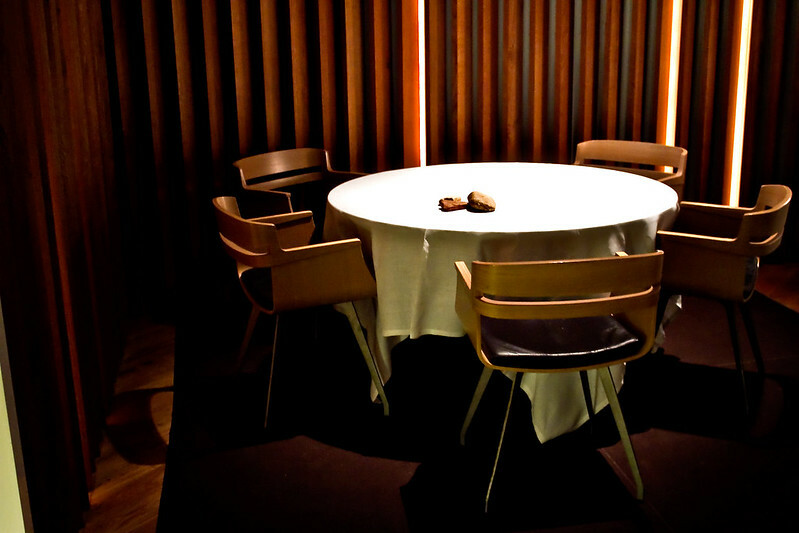 Its number two spot on The World’s 50 Best Restaurants list is well-deserved. We look forward to being back and trying out their menu in a different season. 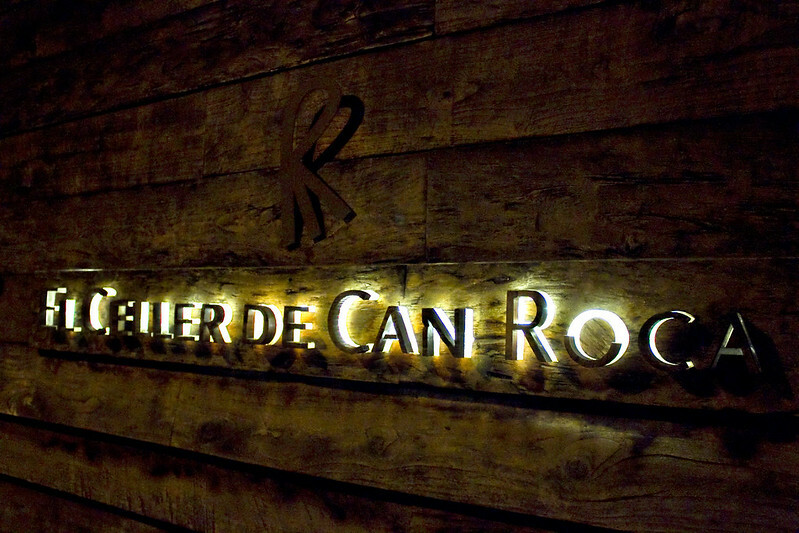 You can make your reservations at restaurant@cellercanroca.com. 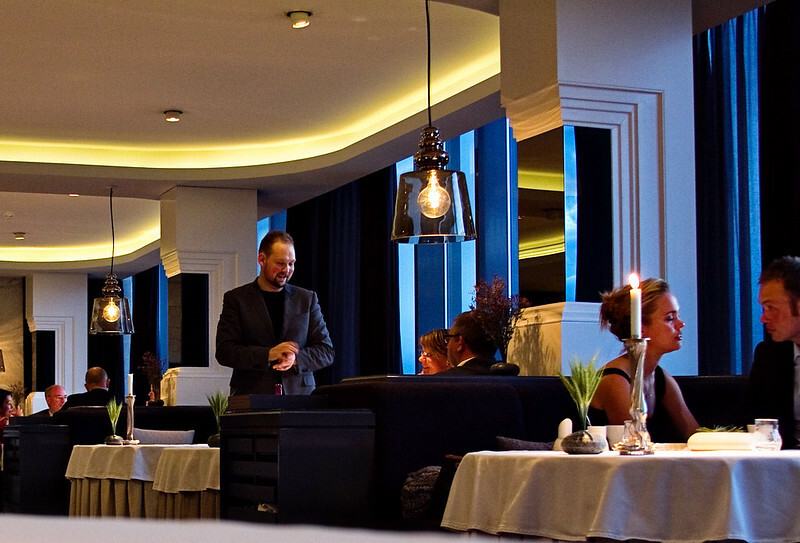 “You are very welcome,” said Chef Rasmus Koefoed as he approached our table with our first main course. We didn’t know what we were being served or too much about him. 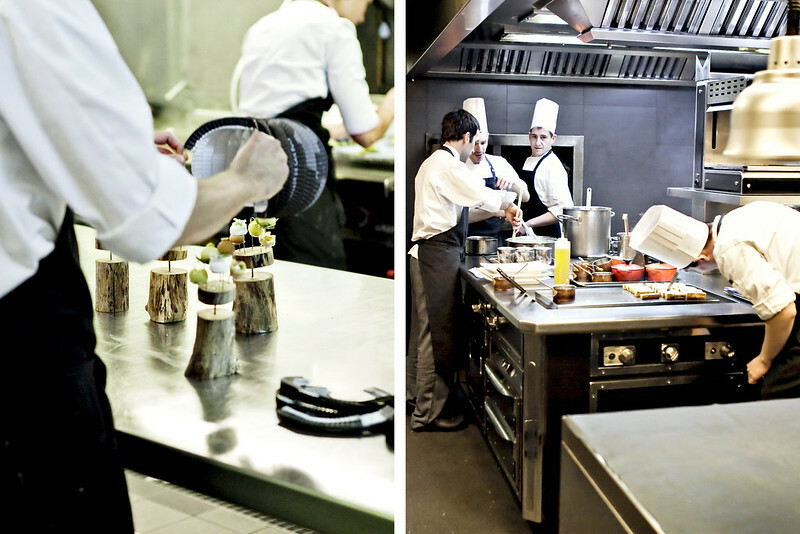 It turned out out he is a three time participant and gold winner in the Bocuse d’Or; an intense culinary competition of the world's best chefs. Robert was lucky to get this booking at the last minute only a day earlier. 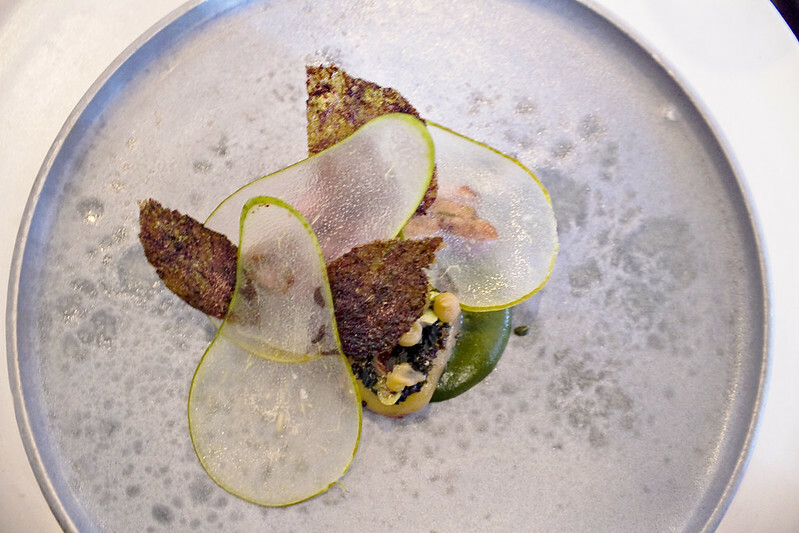 He booked it only knowing that it was number 49 of the World's 50 Best Restaurants and that Copenhagen had become a culinary destination. This feeling of “not knowing” was mainly the theme surrounding our evening since we got off a taxi cab outside the Fælledparken in the Østerbro area of Copenhagen. 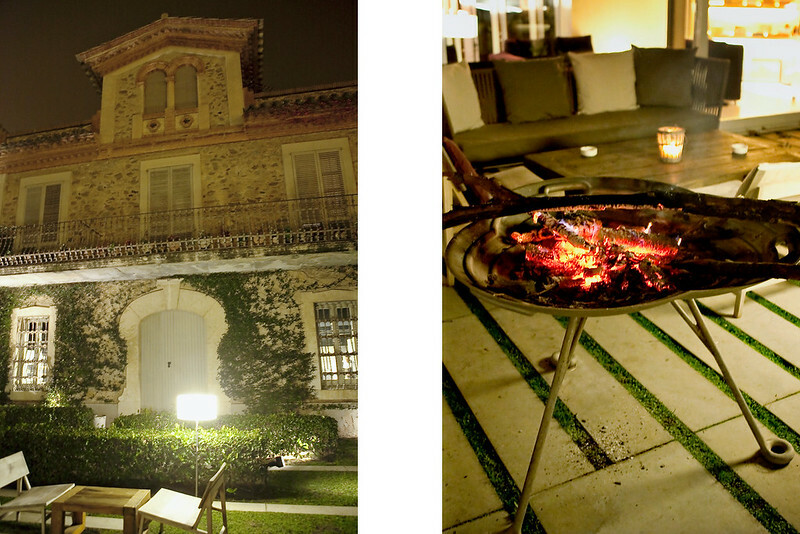 It was our first dinner at a Michelin Starred restaurant. 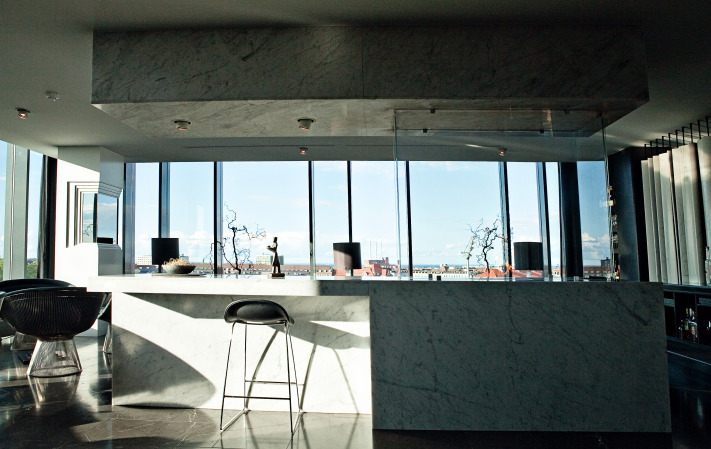 As the elevator door opened to the 8th floor, we were greeted by two receptionists behind a counter area. They checked us in and got our coats for us before leading the way to the dining room. The room was very spacious and sleek with big tables and plentiful space between them. Everybody in their dressy clothes were already seated enjoying glasses of wine. 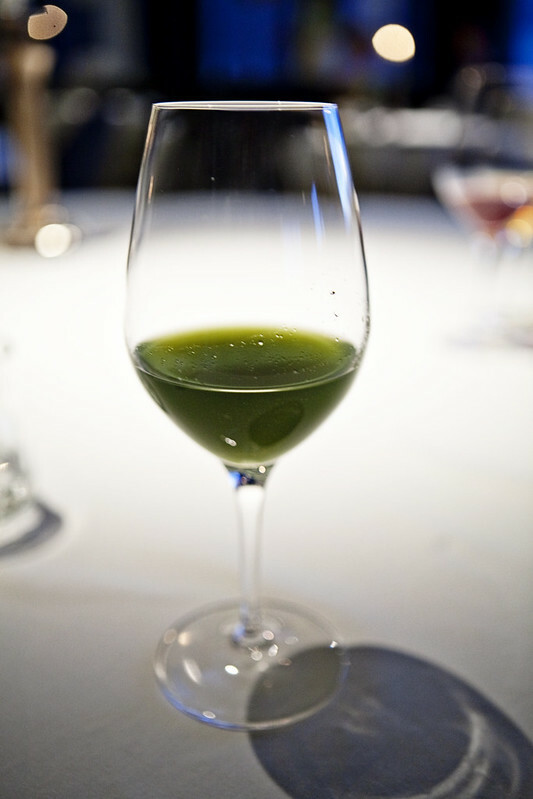 After settling in at our table, we already knew what we were going to have - the Universe Tasting menu with juice pairing. 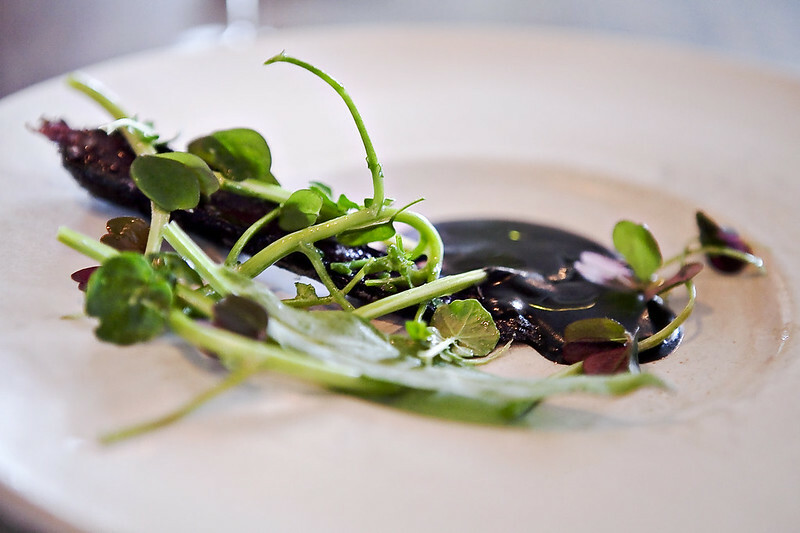 This selection included 14+ courses made with ingredients specific to Denmark and the season. 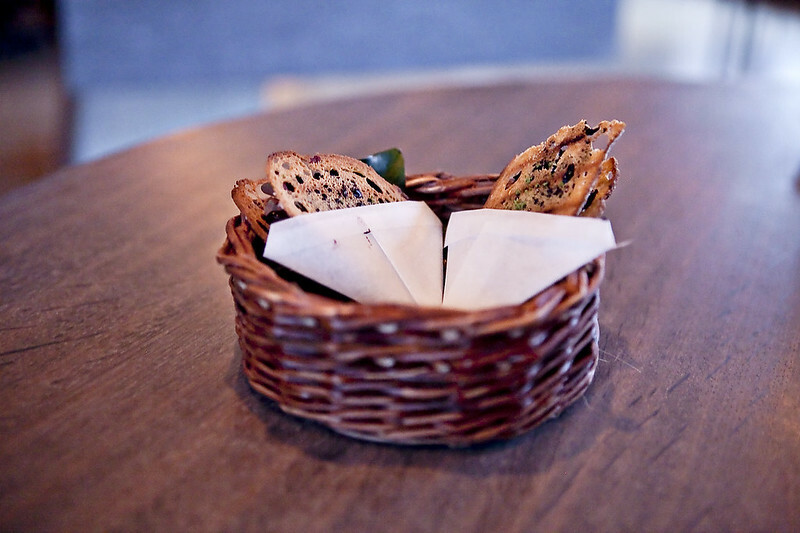 We were first served with amuse bouches or snacks as they called them. 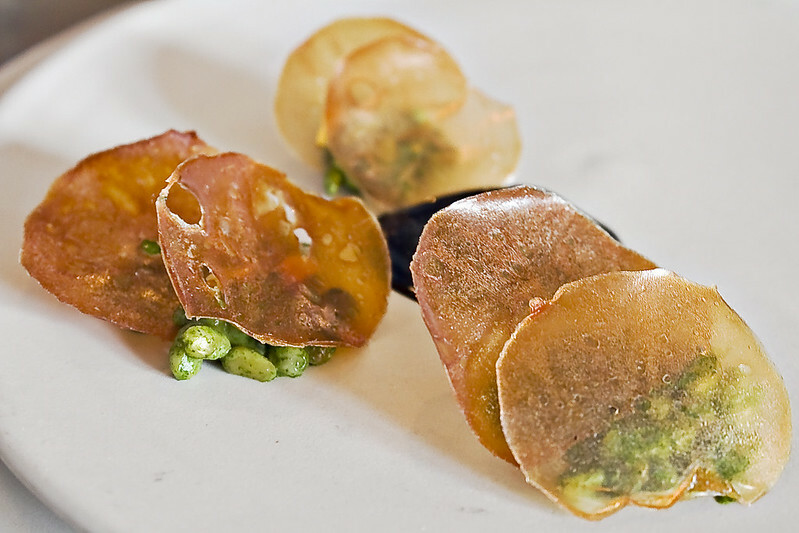 Potato Chips & Seaweed: Delicate chips that were slightly salty held a strong ocean flavor. Carrot & Seabuckthorn: We thought they were berries when these were brought out. 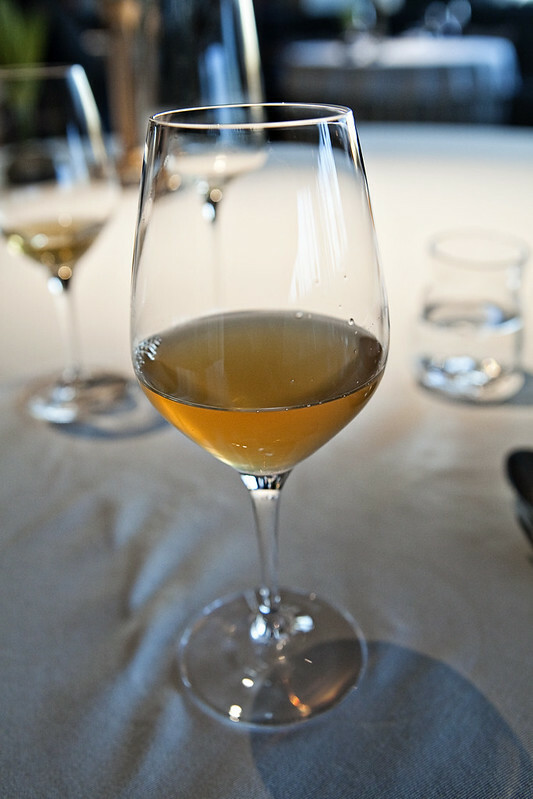 But, we would not have guessed that they were candied carrot juice filled with seabuckthorn foam. They tasted like tangerines although a bit less sour. Seasalt Cheese & Ramson: Bread sticks that came with a dipping sauce flavored with ramson. The salty bread sticks went well with the pungent taste of the sauce similar to that of garlic. 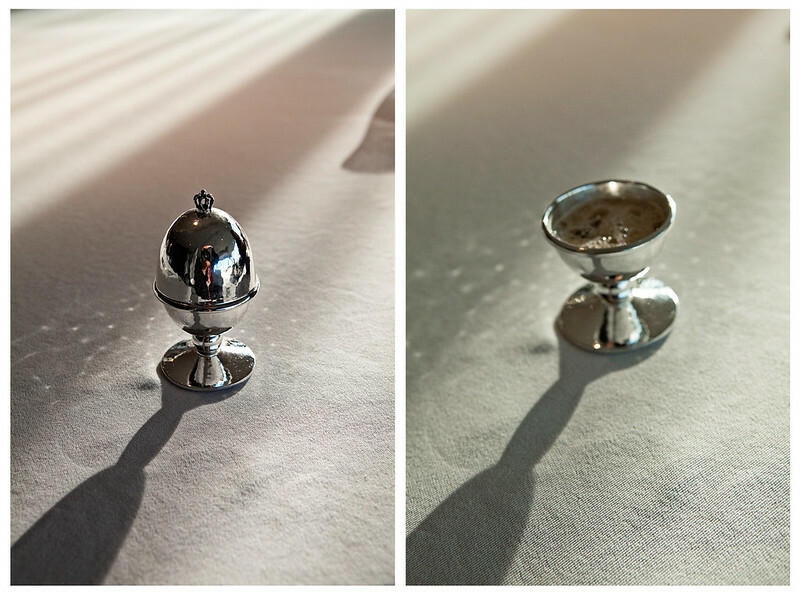 Mushrooms: When these fancy silver egg cups were place in front of us, we thought we were about to eat a dish made with eggs or resembling eggs. 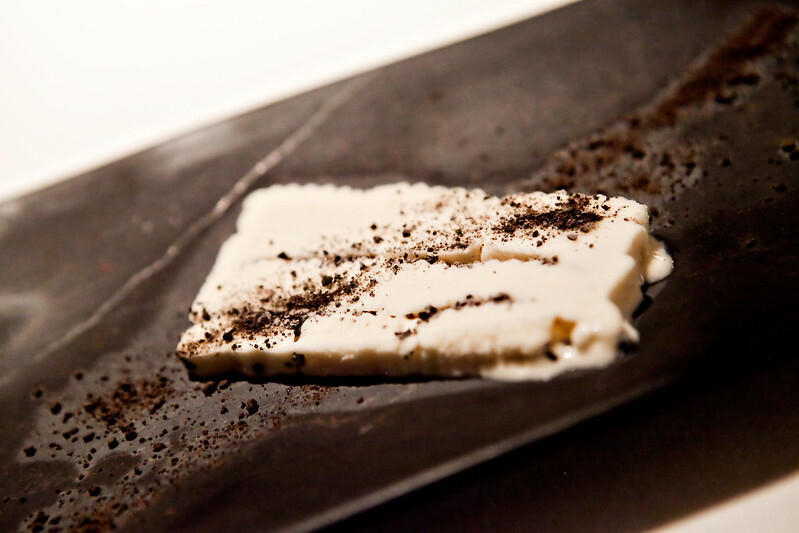 But as one of the chefs opened them, we were introduced to mushroom foam that was rich and savory. 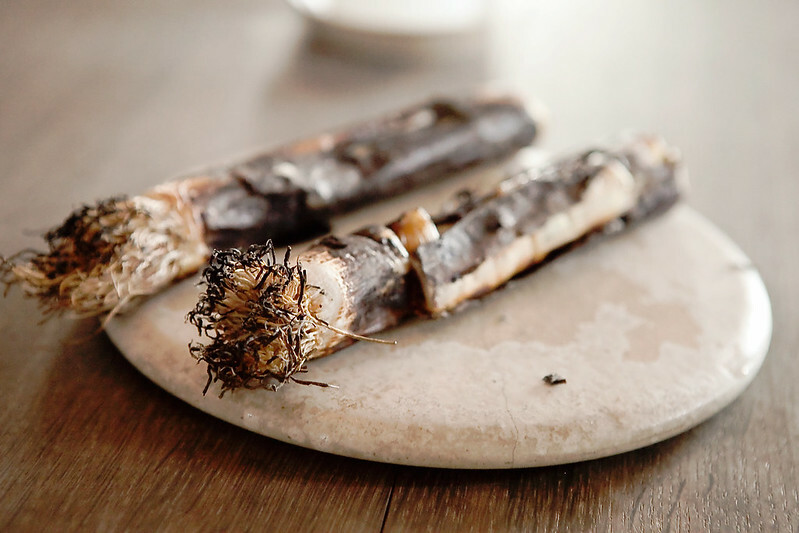 Razor Clams: Razor clam tartare wrapped in squid-ink crusts that looked like shells. Yes, they get creative with their servings! 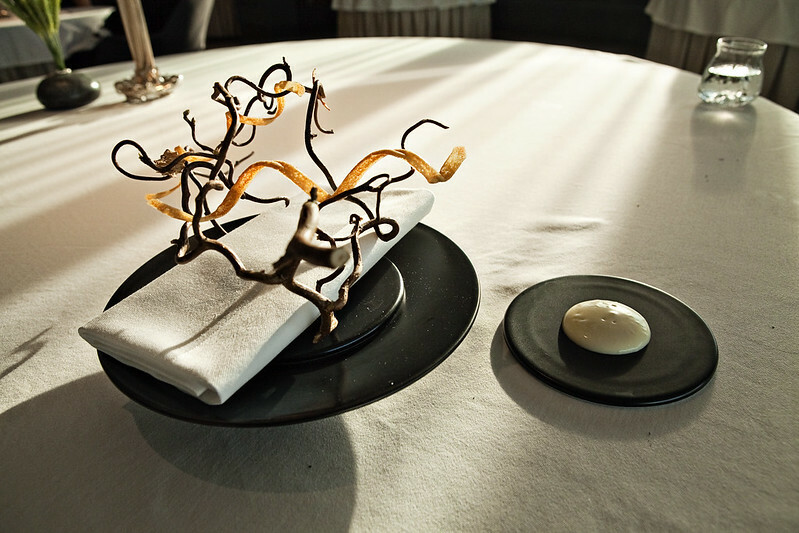 Jerusalem Artichoke Tree & Walnut Oil: The strips coiled in the branch were made of Jerusalem artichokes. Each strip delightfully went well with the rich nutty taste of the dipping sauce seasoned with walnut oil. The chef had to remind us that the branches were inedible. Good thing he did or we would have tried to eat them too! Our first glass of juice came when they finished serving the snacks. Lemonade with Pine Juice: The lemonade mixed with the freshness and minty sensations of coolness from the pine was truly refreshing. 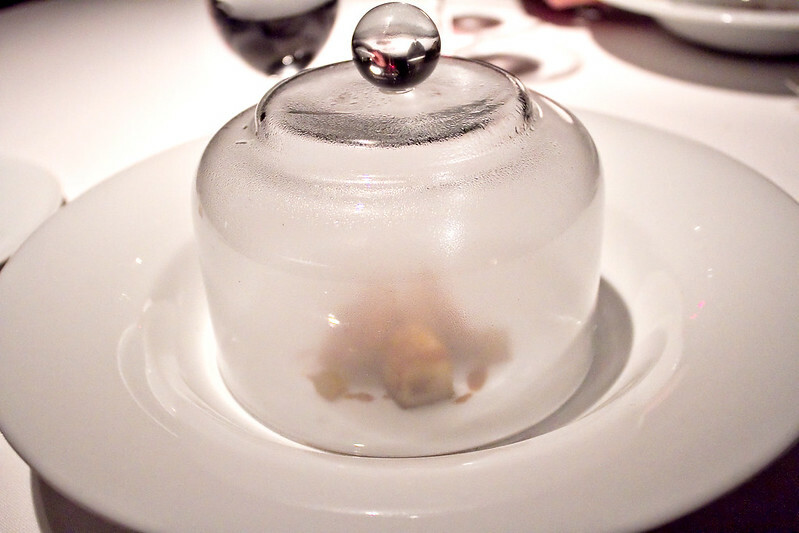 Jellied Ham, Tomato Water & Rapeseed Flowers: This was one of the most flavorful dishes we had up to that point. As soon as we bit the jellied spheres, a gush of liquid that tasted like ham exploded in our mouth. The smokey, sweet and salty flavor of the ham was complemented by the slight bitterness from the rapeseed flowers and the umami taste from the tomatoes. 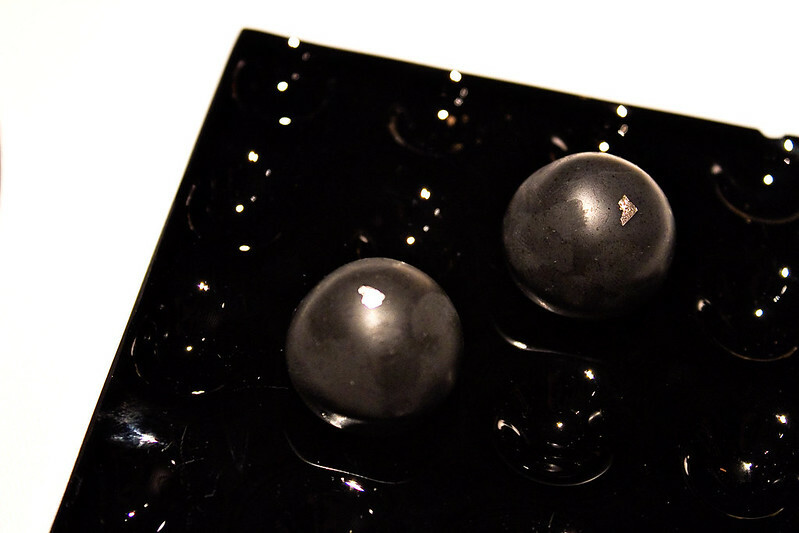 Dillstone & Fermented Vegetables: Inside these green “stones” was a gel-like substance made of dill and salmon meat. It came with a dipping sauce made of roe and dill stems. These bite-size wonders were truly pleasant and flavorful. The Perfect Scallop: One of my favorites from the night. This salted scallop rested on butter sauce and was topped with elderberries. Like with the rest of the seafood served, the scallop was fresh and succulent. Everything on this plate was amazing! Algiers, Cucumber & Apple Juice: As the name suggests, this juice was a mixture of aloe, cucumber, apple with a touch of celery. It was a delectable drink. More please! 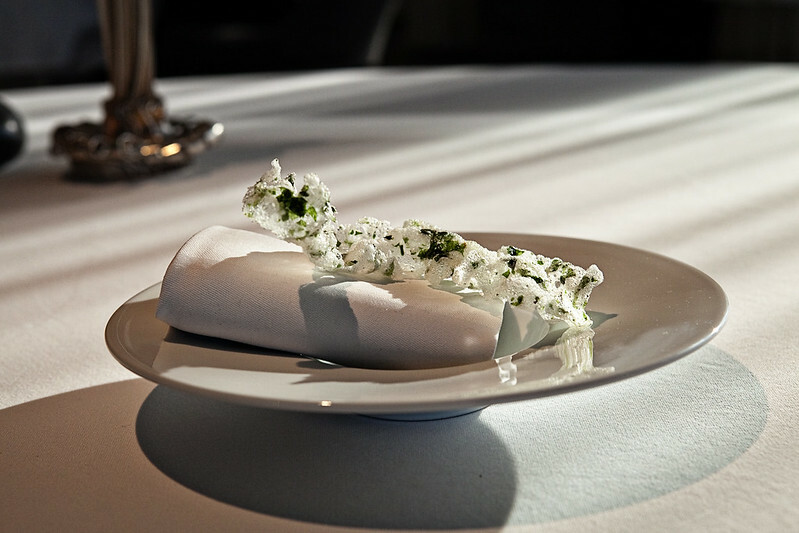 Hake, Horseradish Juice & Herb Stems: The meat of the hake was wrapped inside an Icelandic dairy product, which reminded us of yogurt. Jonagored Apples Juice: First of the various types of apple juice served to us that evening. This one was wonderful and had a sweet and tangy taste to it. Bread with Emmer & Spelt: Warm and delicious pieces of sourdough bread (made with spelt and topped with oats) were placed in front of us. They became even more tasty when eaten with the buttermilk spread that came with them. Onions & Melted Hay Cheese: The most unforgettable thing about this dish, aside from its taste, was the extravagant way it was brought out. There were three people who served this dish to us. The first one brought out a plate with the onions, the second one brought out the sauce in a silver tea pot, while the third one brought out a shiny horn with black crumbs inside it. 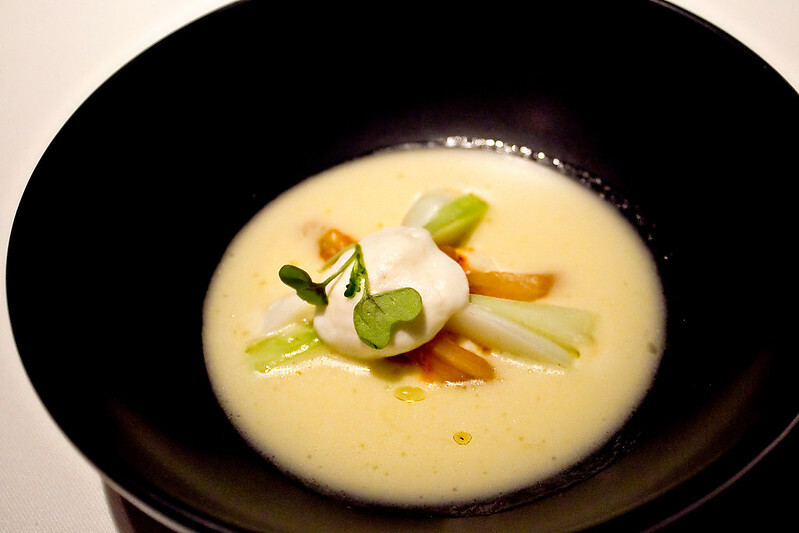 The soup made with hay cheese was poured on top of the sweet onions, while the bread crumbs coming from the horn were delicately sprinkled on top of the dish. This was all happening right in front of us which made the experience even more interesting. 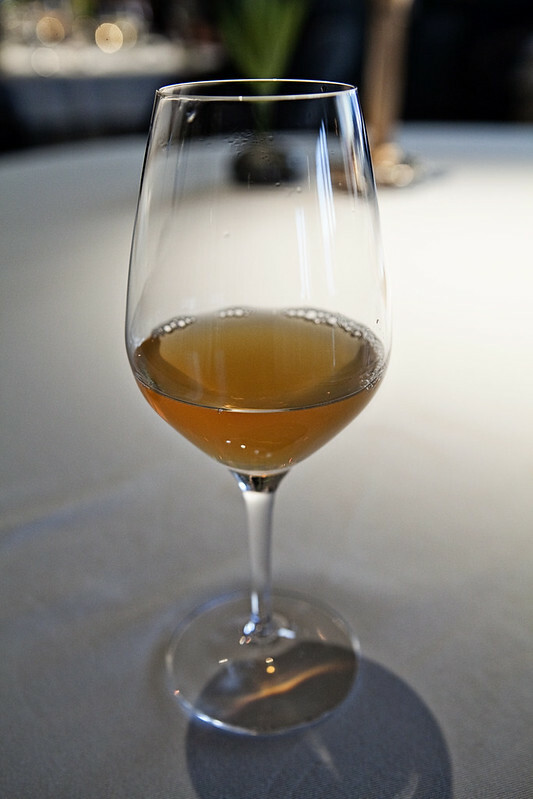 Ingrid Marie & Tarragon Juice: Ingrid Marie is a kind of apple from Denmark. The juice was light and smooth. Elements of the Sea: Made of chopped oysters, lumpfish roe, different types of seaweed, sea herbs and a beurreblanc (buttersauce), this dish was exquisite! Pigeon Apple: The juice was very aromatic and sweet. 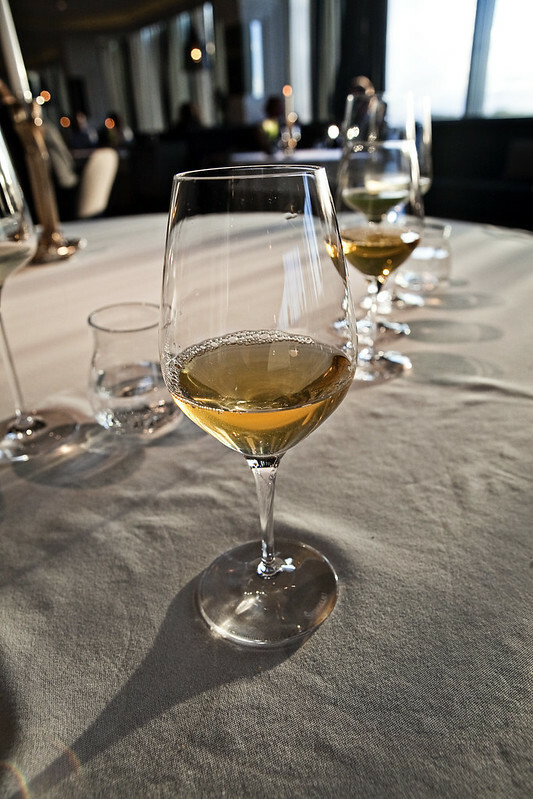 I could taste the difference between this apple juice and the other glasses of apple juice we have been served with. I never realized that apples came in so many different varieties. 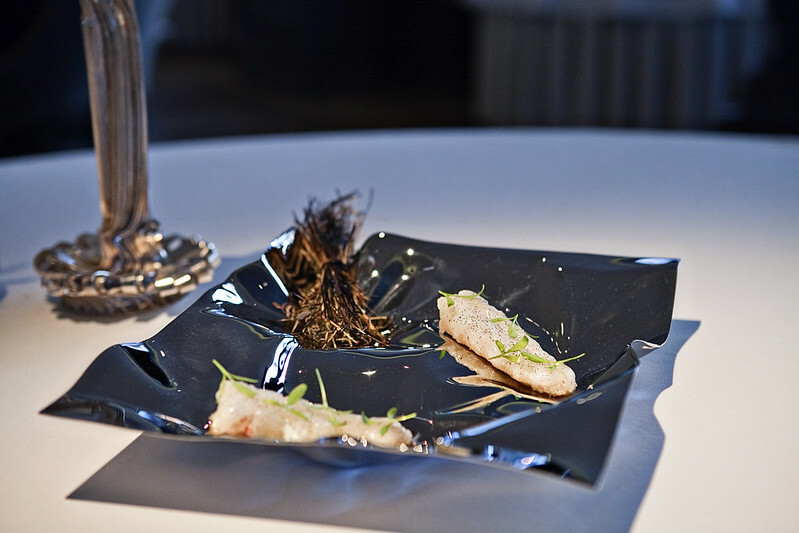 Langoustine & Hay Aroma: Perfectly cooked langoustines seasoned with herbs, flowers, and herb sauce lie on an artsy silver platter in front of us. A very pretty plate but would the taste be pleasant as well? Of course it did! The dish had a pristine taste. 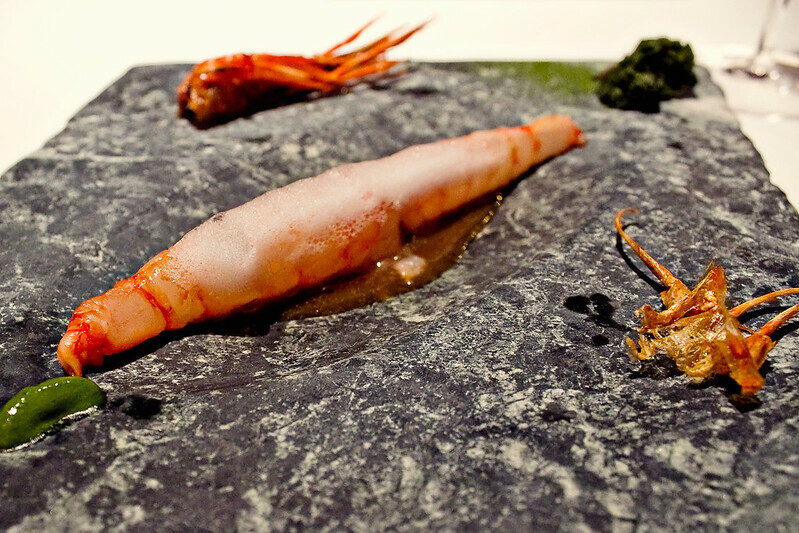 The freshness of the langoustines was made perfect by the earthiness of the seasoned herbs on top of them. Cold Verbena Tea: A glass of verbena tea with lemon and basil. It tasted like sweet, minty chamomile tea. This drink was soothing and also served as a pallet cleanser. Ready for the next dish! 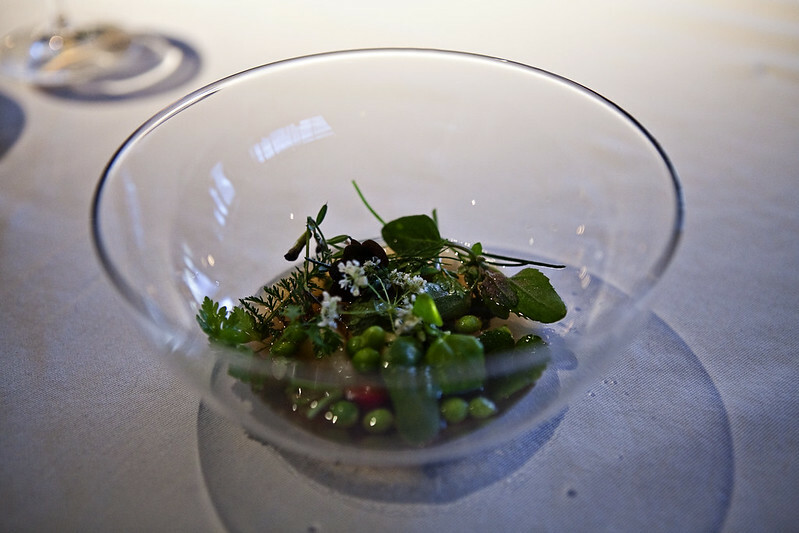 Herbgarden: This is Rasmus Kofoed's signature dish. 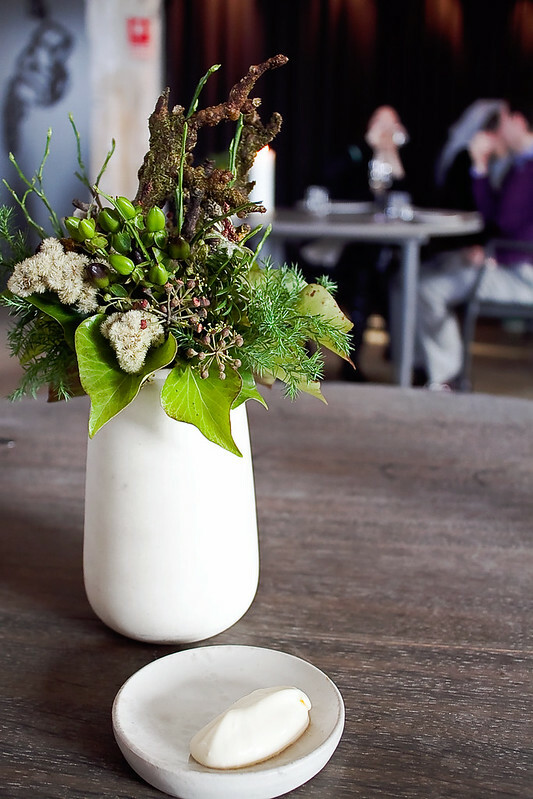 The broth was based on cured lamb which we watched poured over a bowl containing foraged flowers, fresh herbs, and Danish asparagus. 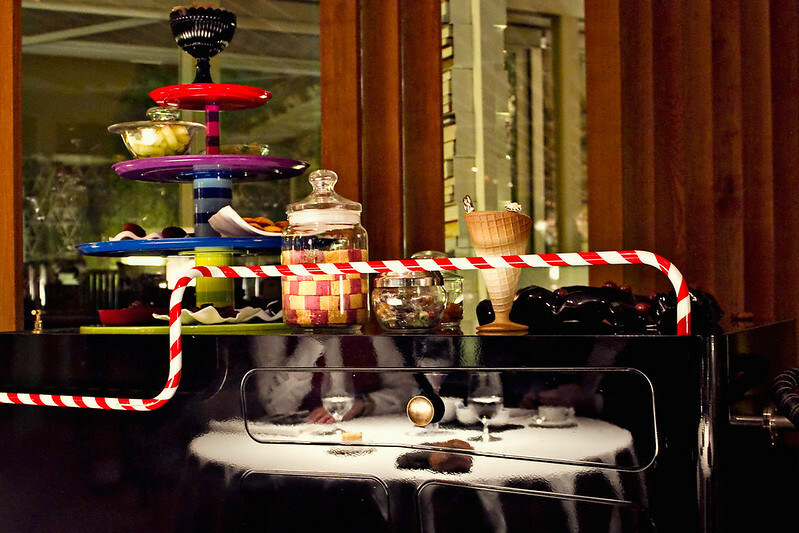 We couldn't wait to dig in to this mouth-watering spectacle as we watched the dish being prepared at our table. Each bite delivered the essence of Denmark. The dish was intriguing yet wonderful. 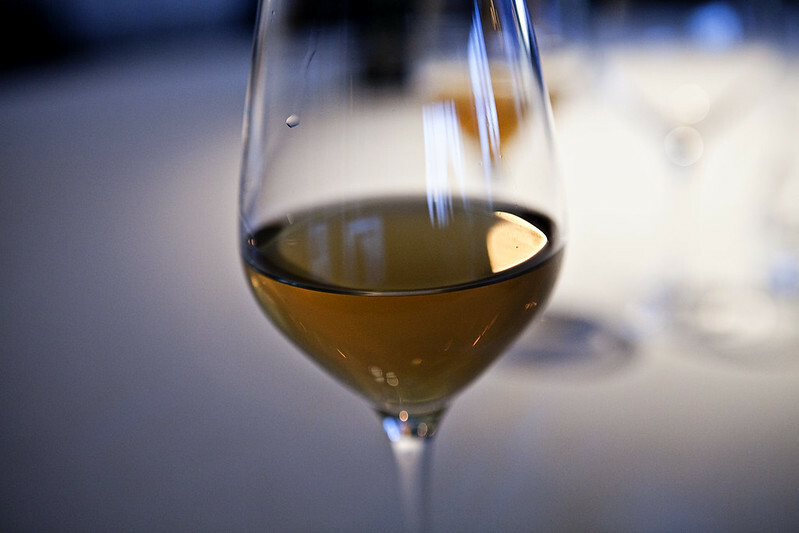 Grape & Juniper Juice: The juice was sweet mixed with a piney and earthy taste coming from the juniper berries. This drink was a little bit thicker with more intense flavors than the other drinks. It almost tasted like red wine sans alcohol. 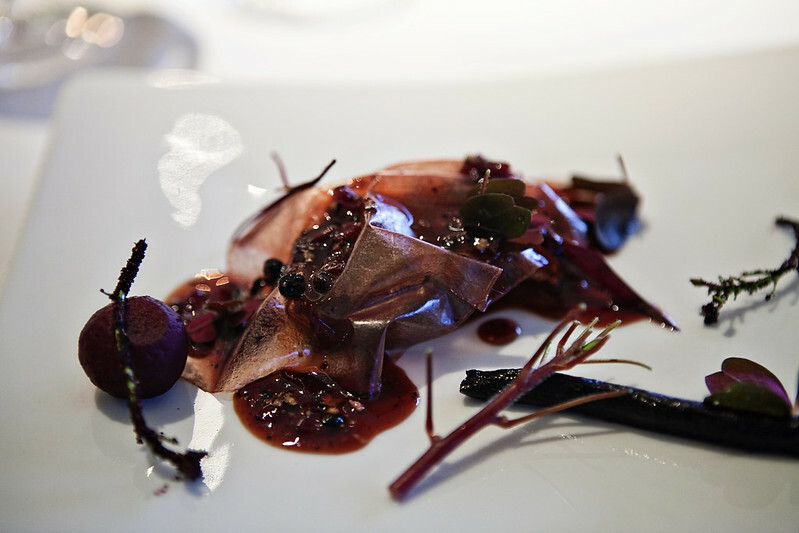 Deer, Beetroot, Berries & Stems: The deer was soft and tender lying on a sauce made of beets, berries and mushroom. On top of it was a cherry vinegar film. I did not enjoy the dish as much, not sure if it was because I was put-off by the idea that I was eating a reindeer (poor Rudolph) or because I was getting full. I swear I heard the chef say "reindeer" when he was introducing the dish to us. 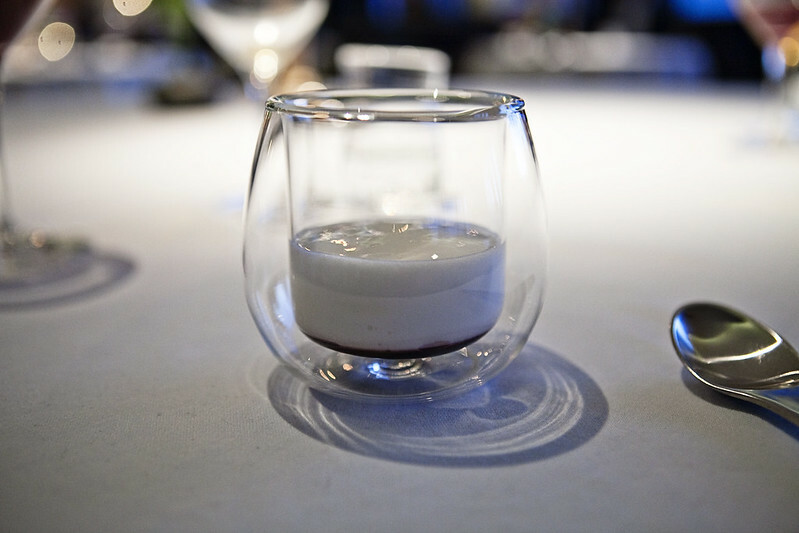 Elderflower Soda: The top layer of this dish was foam covering about three spoonfuls of elderberry jelly. I really enjoyed each spoon. It seemed as if various tastes of goodness and pleasantness danced in my mouth as I took in one spoon after another. The whole cup had just enough sweet in it with a slight hint of acidity. 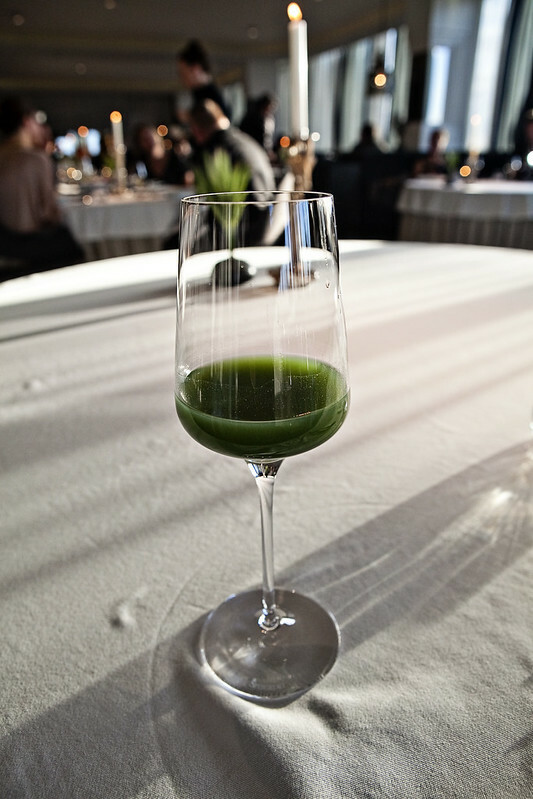 Wood Sorrel Juice: This drink was concocted with wood sorrel and woodruff. We didn't know what they were but eventually found out that they are types of herbs. Beech Tree & Wood Sorrel: This dessert was slightly sweet and smooth, another one of my favorites. It didn't have a sticky aftertaste similar to what you get after eating a whole bowl of sugar. 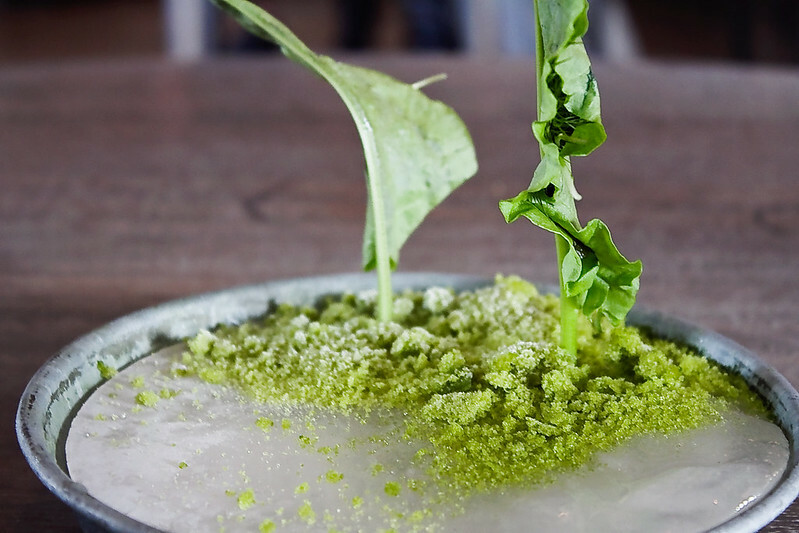 The plate was made of frozen beech tree juice with wood sorrel leaves. The bits on top were ice cream that fizzled in our mouths. 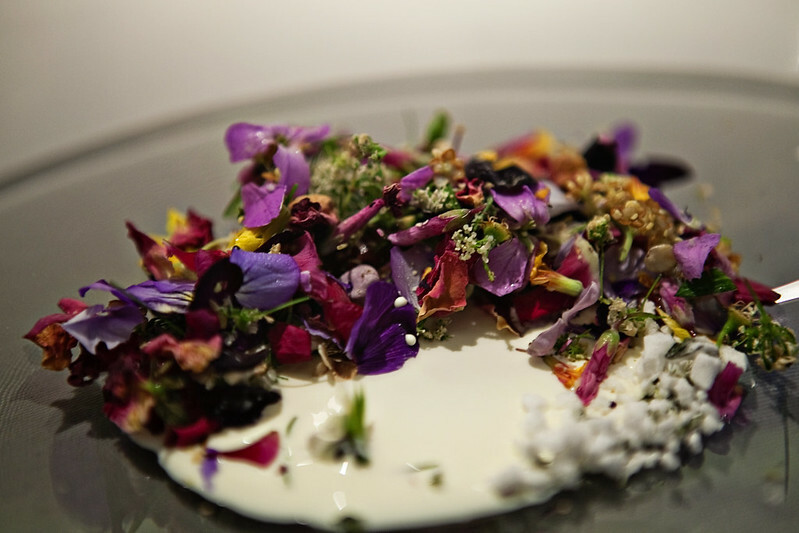 Frosty Flowers, Rhubarb & Thyme: The most beautiful dish of the evening. Rhubarb compote with frozen flower and meringue. The tart flowers and the vanilla-tasting syrup made a heavenly dessert. Green Egg: Egg-shaped chocolates filled with frozen mint filling inside. 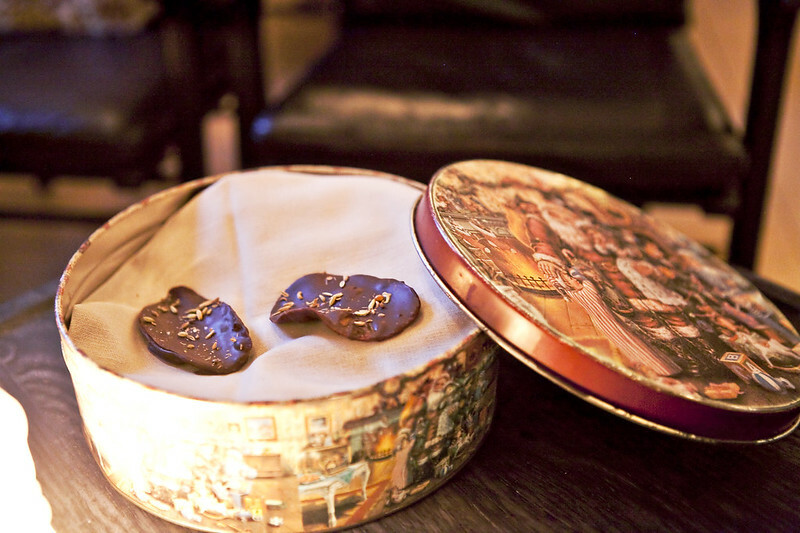 They were your typical chocolate mints but presented in an interesting way. Carrot Leaf: One last treat. Crispy and sweet. As the name suggests, they were carrot-flavored chips. We loved the dinner and happy to have gone. 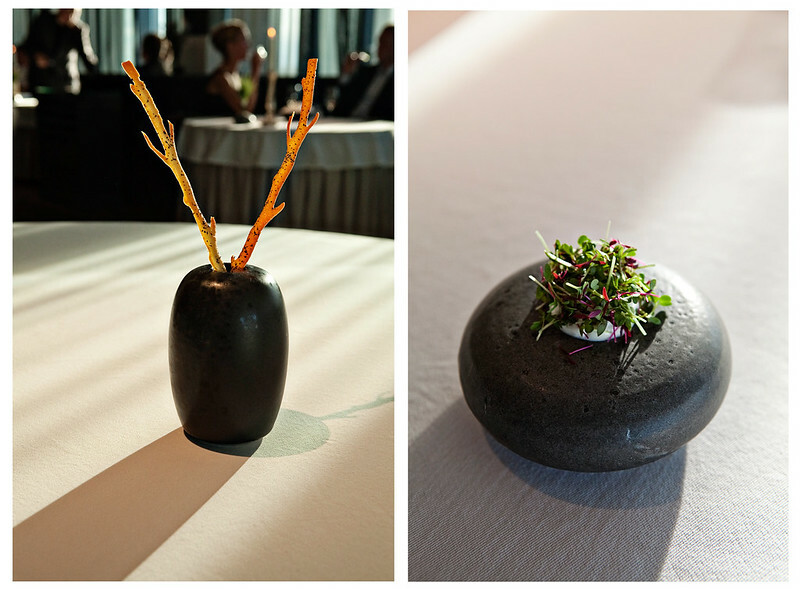 Our palettes were opened to new ingredients and flavors that are considered New Nordic Cuisine. Jerusalem Artichokes, Sweet Woodroof, Seabuckthorn and Elderberries were some of the new ones we were exposed to. I stopped making a list and completely surrendered myself to the experience as I figured that the dishes would come out amazing no matter what ingredients they used. And I was right! 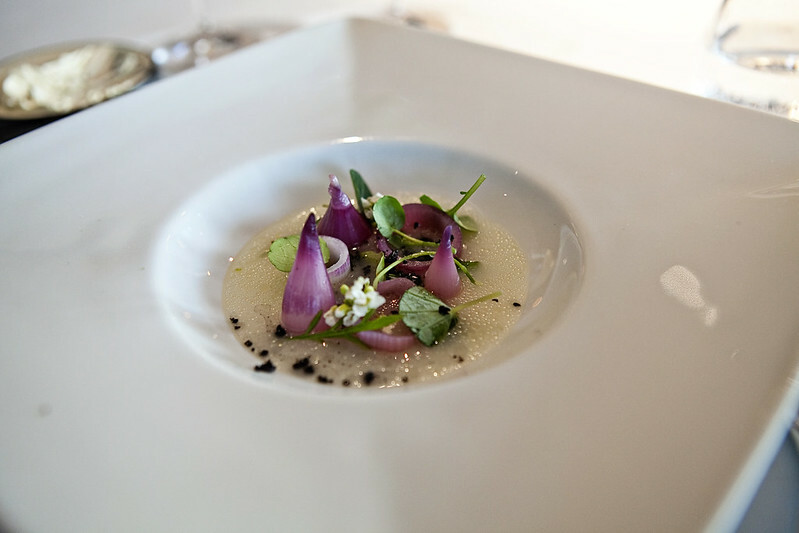 Every dish was visually beautiful, skillfully prepared and flavorful all at the same time.